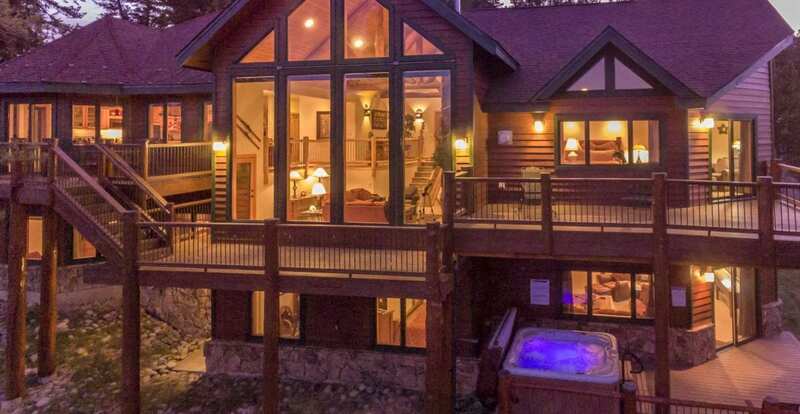 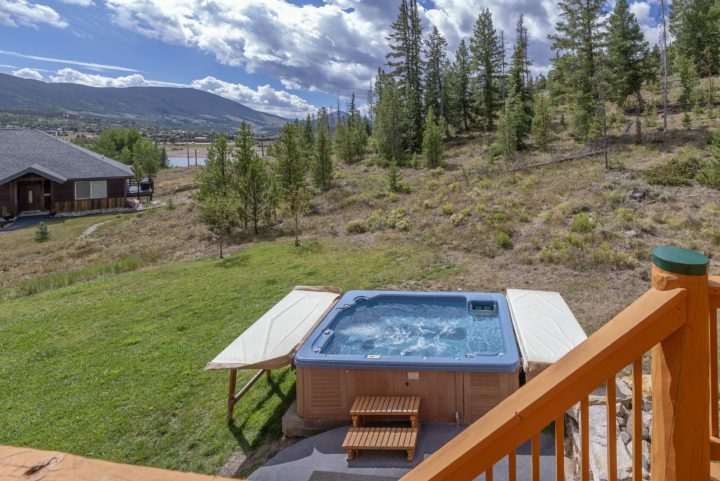 The Homestead--12-person private hot tub; decks on 3 levels; acre lot around house. New fire pit area overlooking 12 person hot tub and sledding hill. Stone walkway from hot tub patio up to fire pit area. 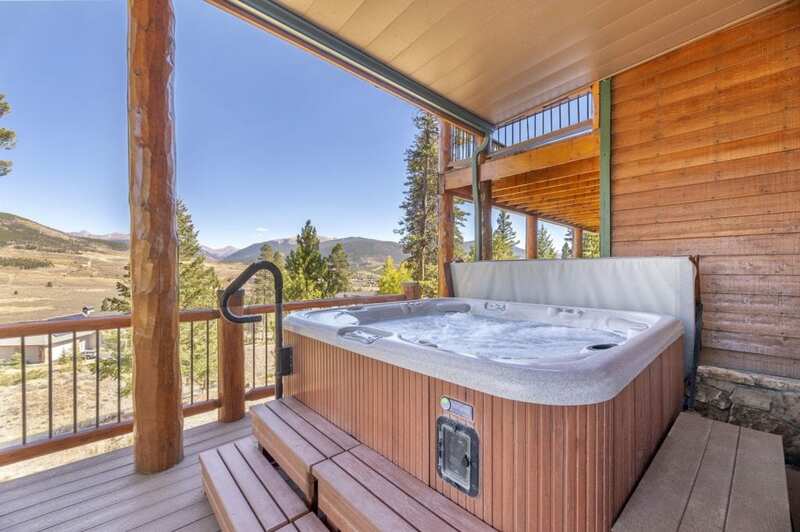 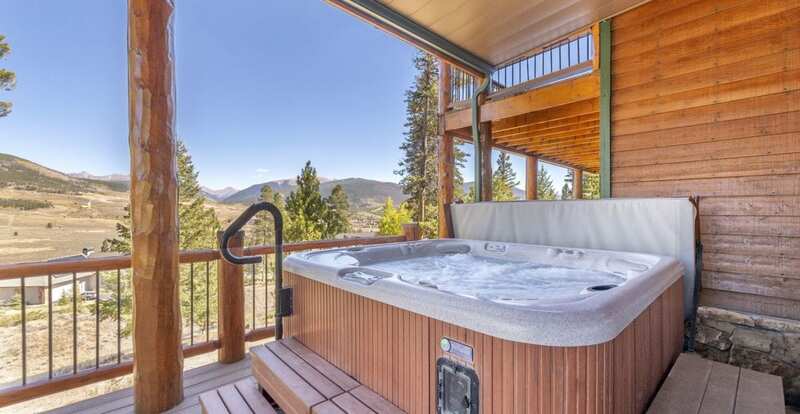 12 person private hot tub (Summer view). 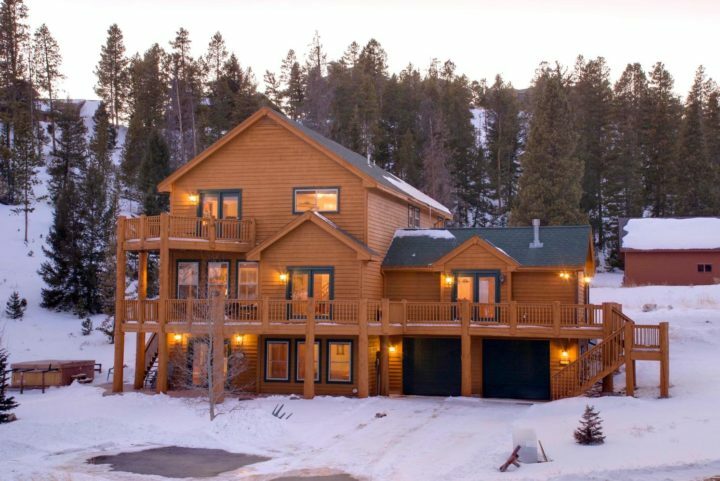 Wooded portion of house's acre lot. 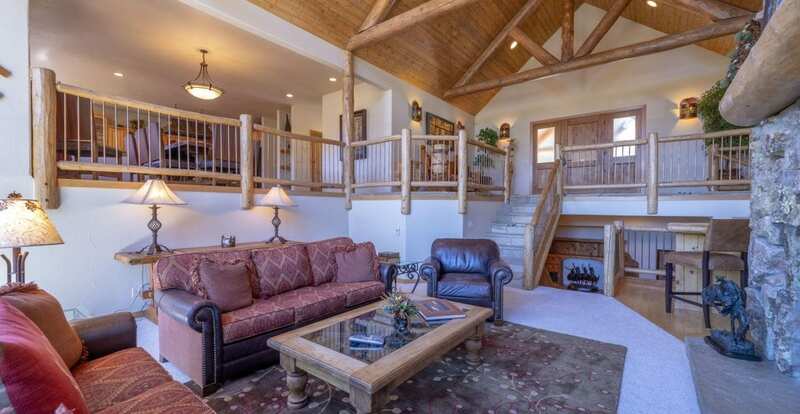 Main Living Room (Middle level of 3 floors). 4 outside doors access deck on 3 sides of house. 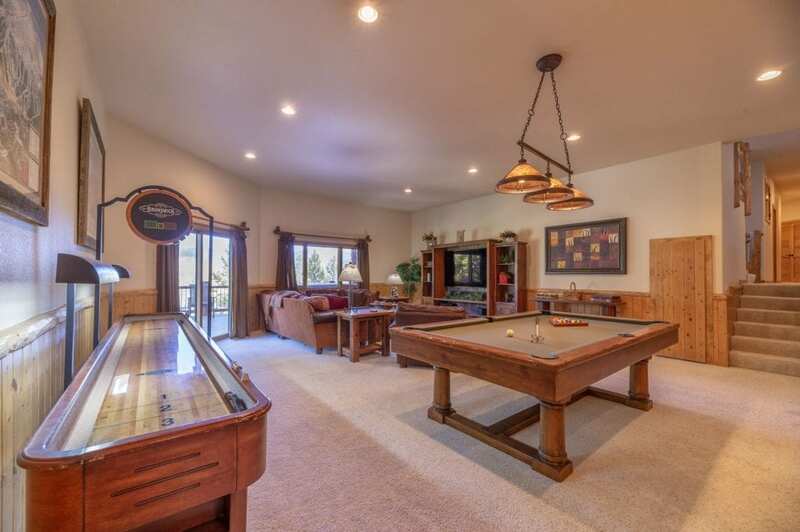 Game table in main living room (middle level). 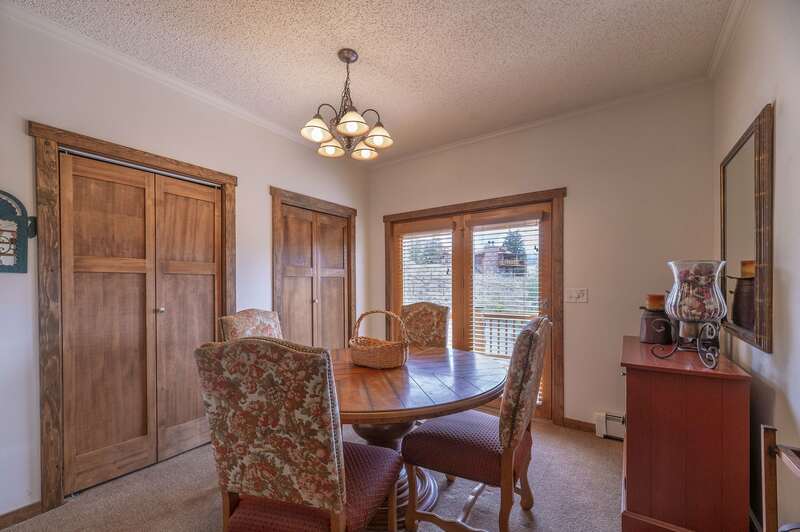 Extra seating for meals also. 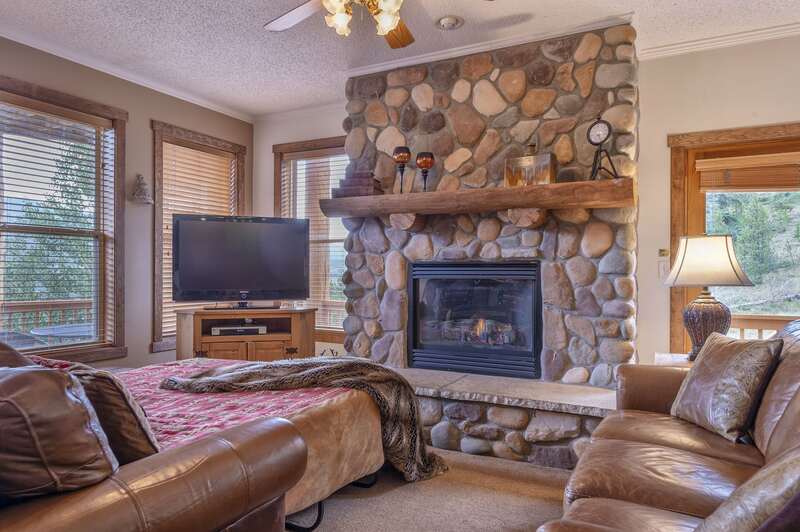 Main living area--stone fireplace, flat screen 1 (HDTV), Queen fold out. 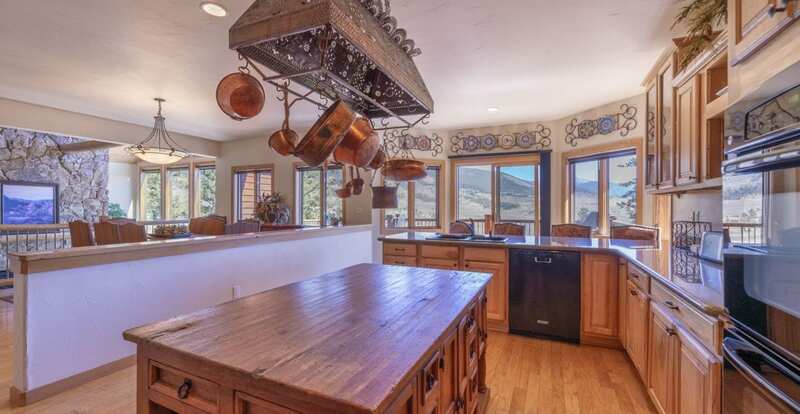 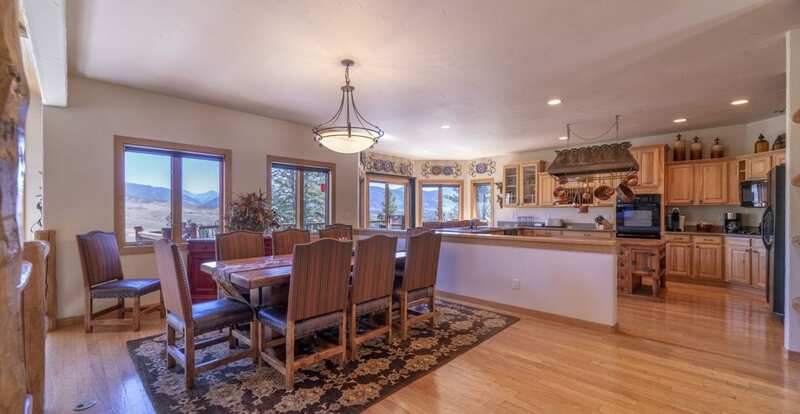 Dining room and kitchen area have the same mile-wide views as rest of house. 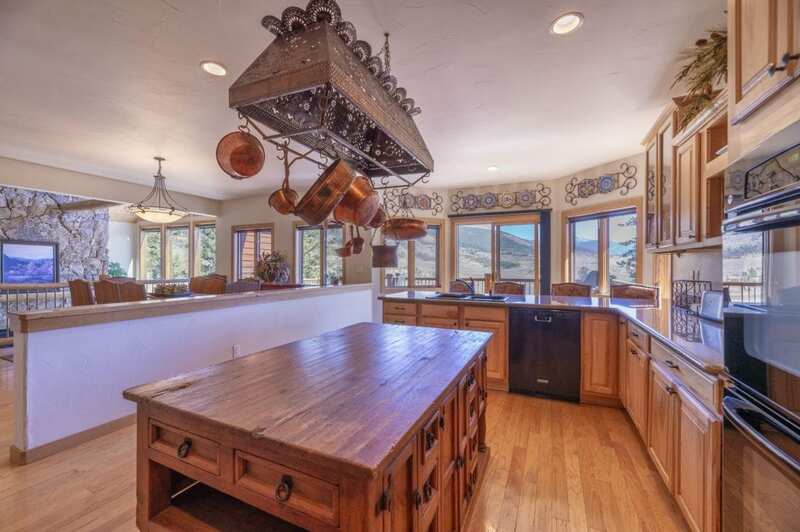 Main kitchen--2 sinks & 3 food prep areas. 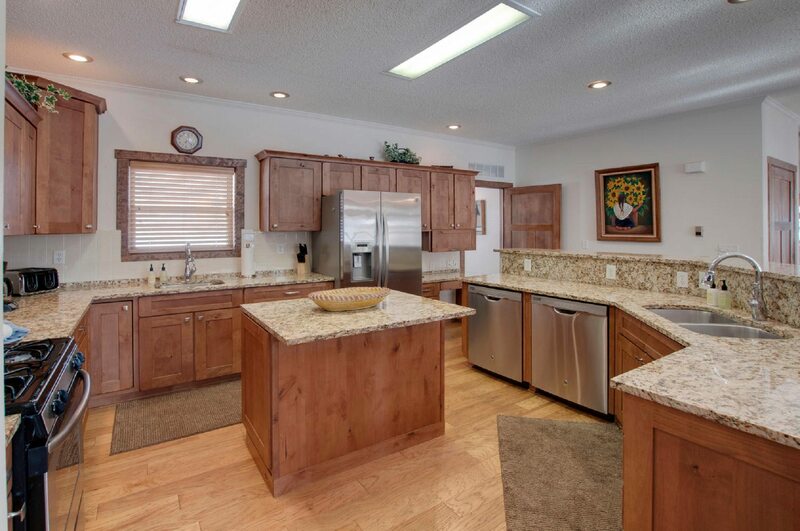 The house has 2 kitchens (total of 3 refrigerators, 3 dishwashers, etc.). 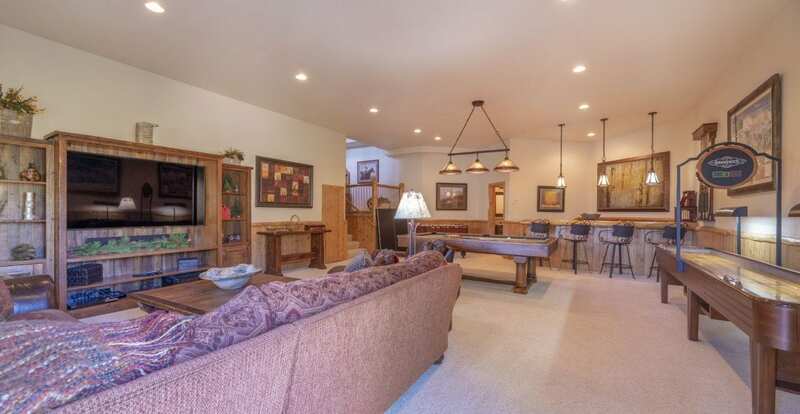 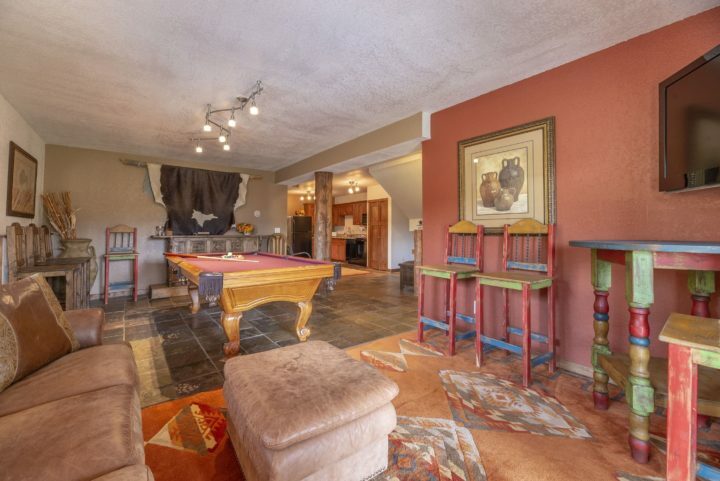 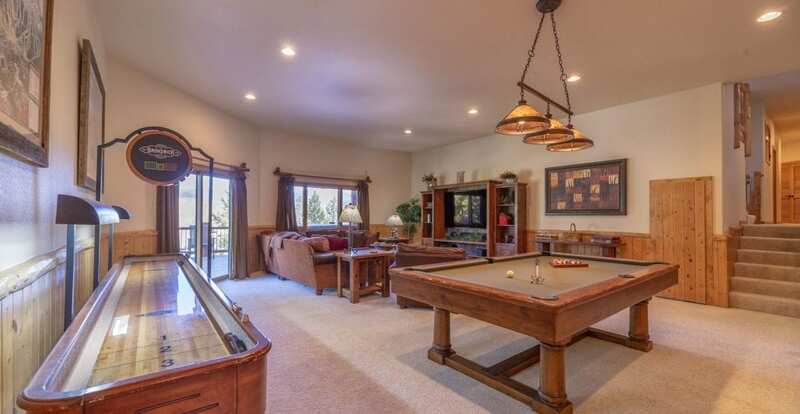 Lower level living room (pool table, TV2, Queen foldout; 2nd kitchen). 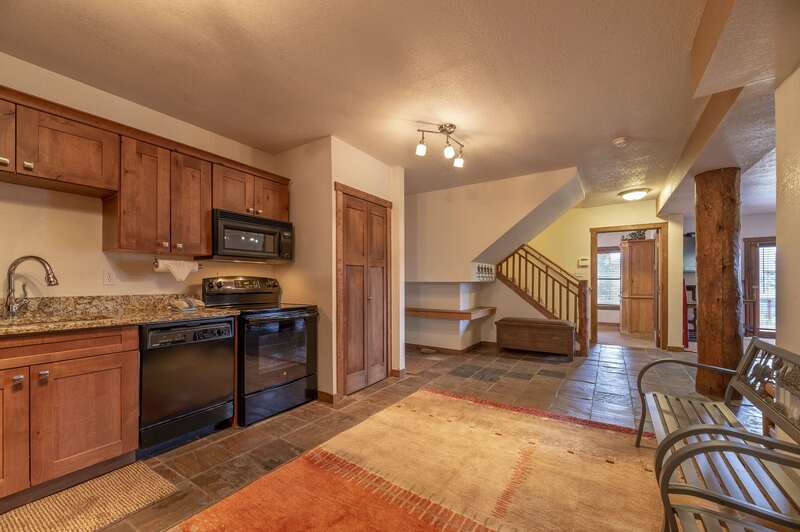 Looking from Lower Level living room toward 2nd kitchen. 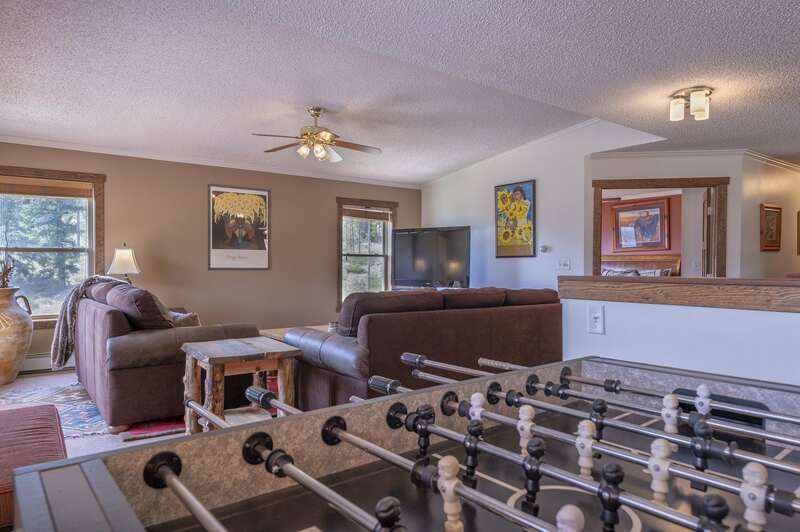 Foosball table in upper level living room. 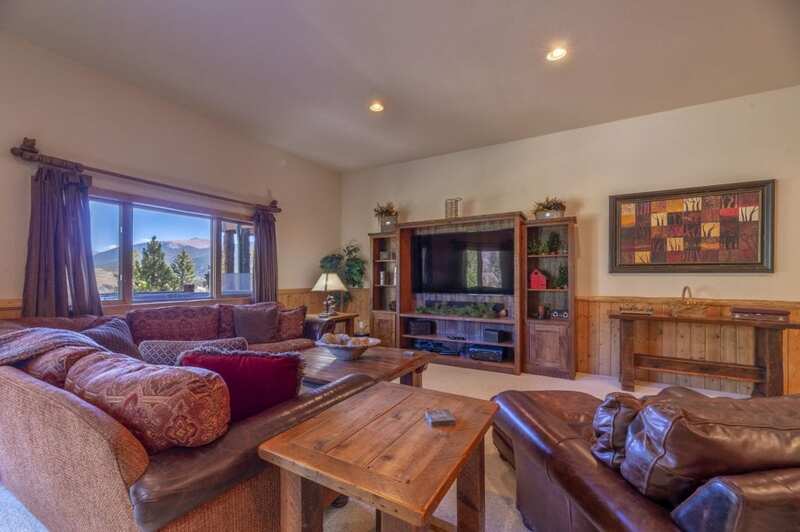 Upper living room has a third half kitchen/snack bar (refrigerator/sink/counter/bar stools). 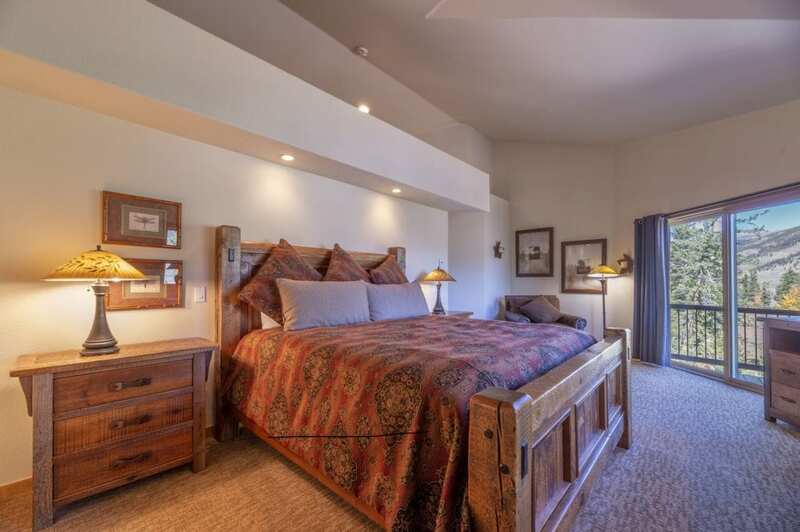 Bedroom 1 (Lower level)--King bed, 4th TV, private bath. 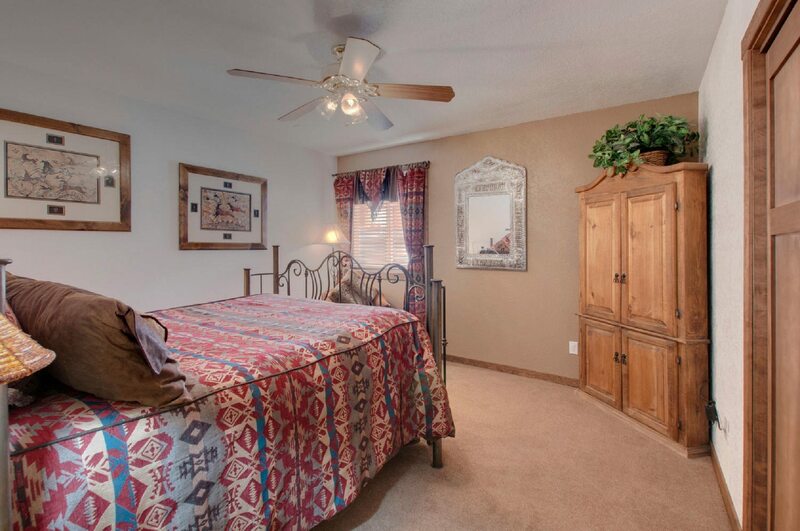 Bedroom 2 (Lower level)--Queen bed, 5th TV, hall bath. Bedroom 3 (Lower level)--Queen bed, hall bath. 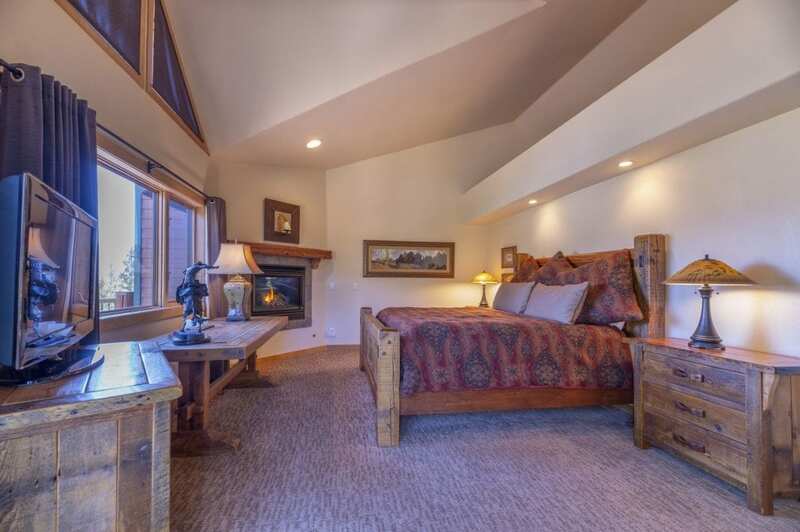 Bedroom 4 (Middle level)--King bed, 6th TV, private bath. 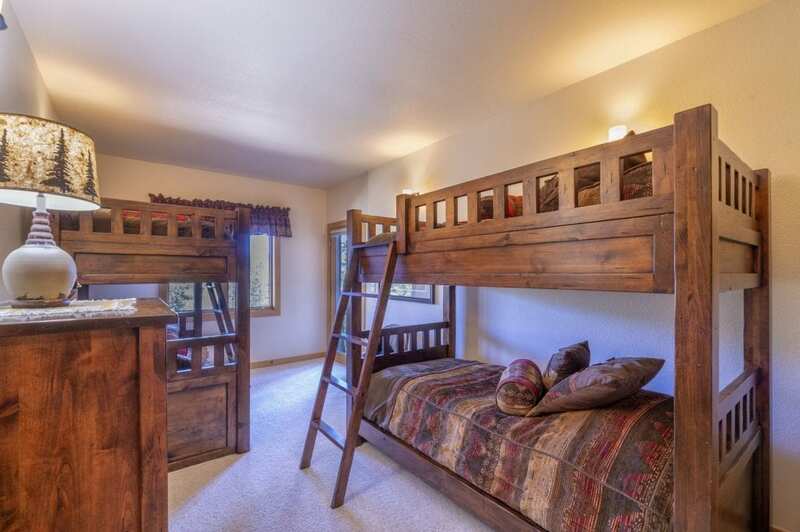 Bedroom 5 (Middle level)--Twin bed + Twin trundle bed (on rollers); hall bath; private entrance to deck. 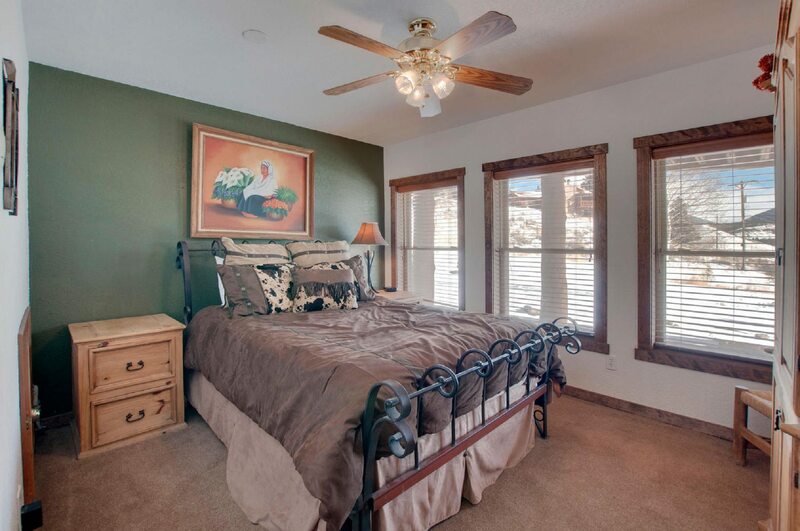 Bedroom 6 (Upper level)--Queen bed; hall bath. 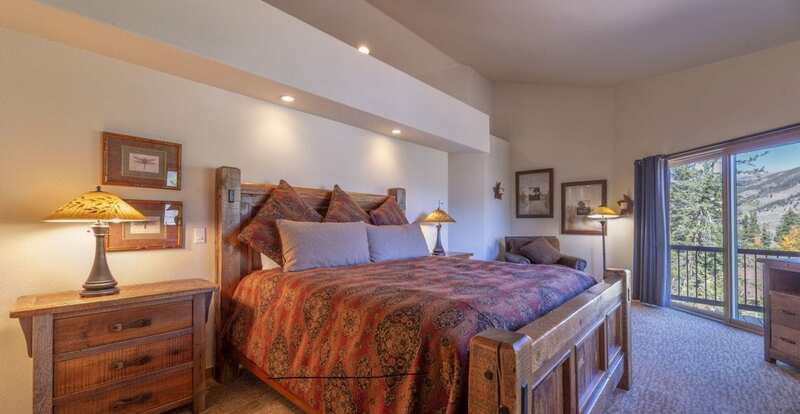 Bedroom 7 (Upper level)--Queen bed; hall bath. 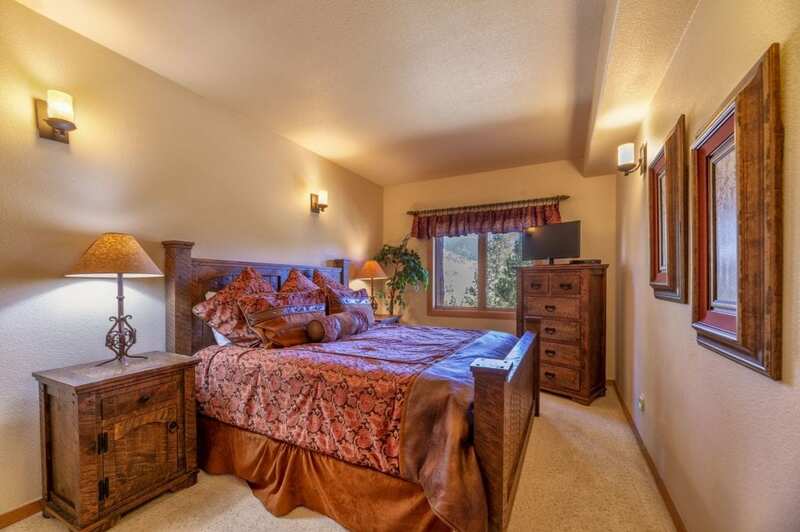 Bedroom 8 (Upper level)--2 Queen beds; 7th TV; hall bath. 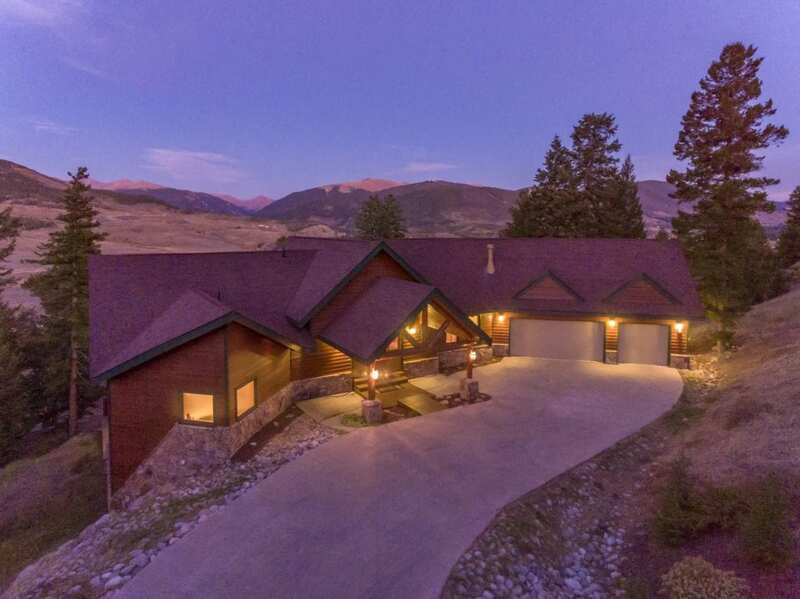 Back of house photo shows 2nd (Upper) driveway and part of panoramic view. 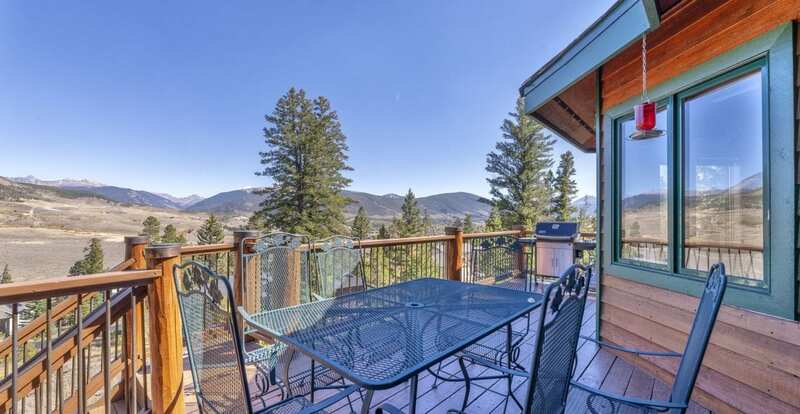 Gas BBQ on wrap-around deck. 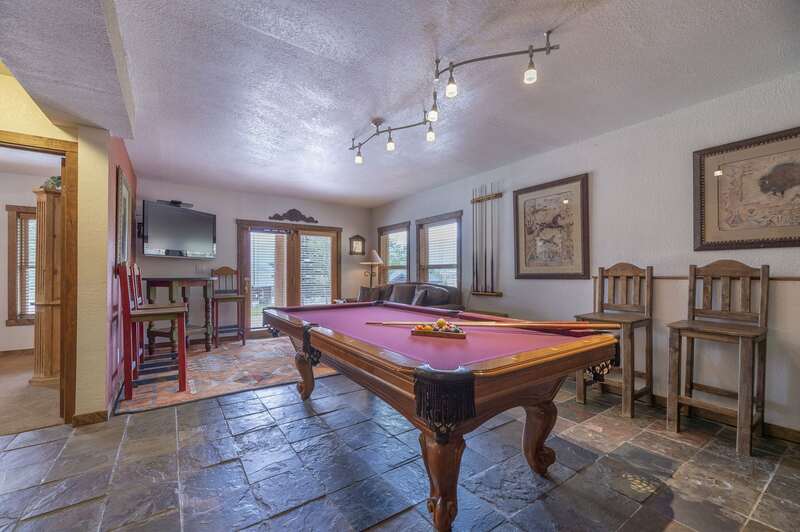 Shows one of FIVE (5) outdoor tables on deck. 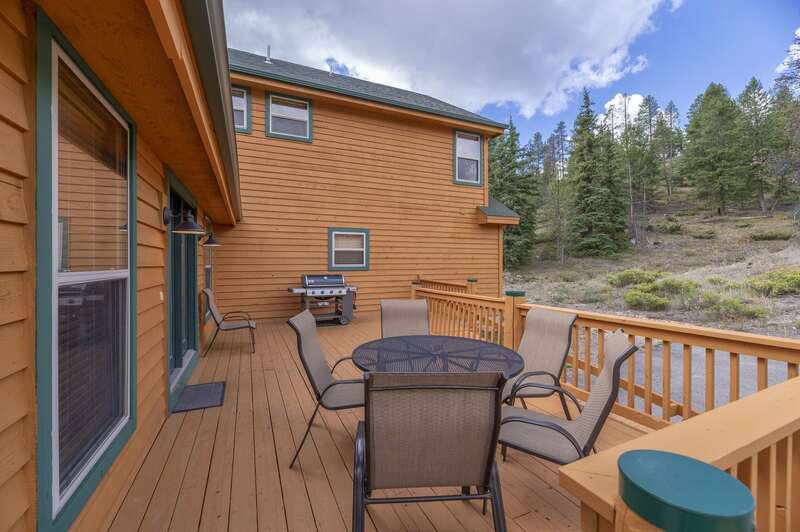 Three more deck tables on opposite side of house. The 5 outdoor tables seat 22. 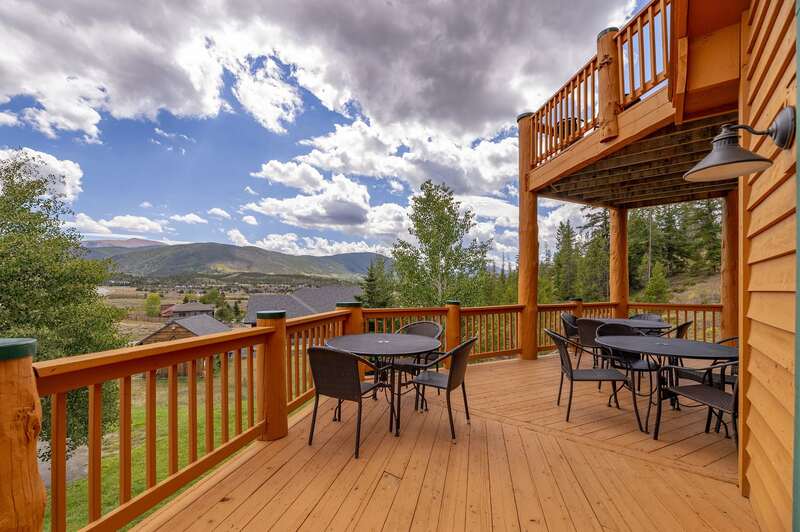 Deck tables offer 10-mile view. Another deck table on the 3rd floor level. 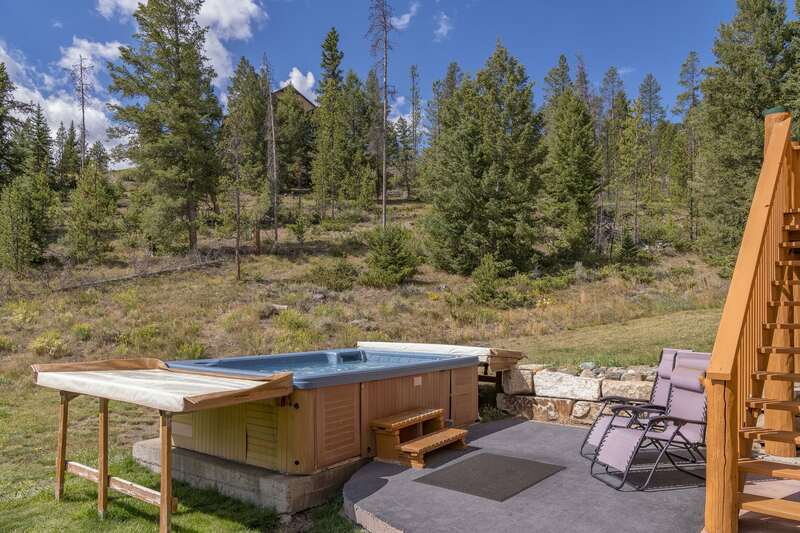 Summer view of the hot tub area and the open space on the lot. 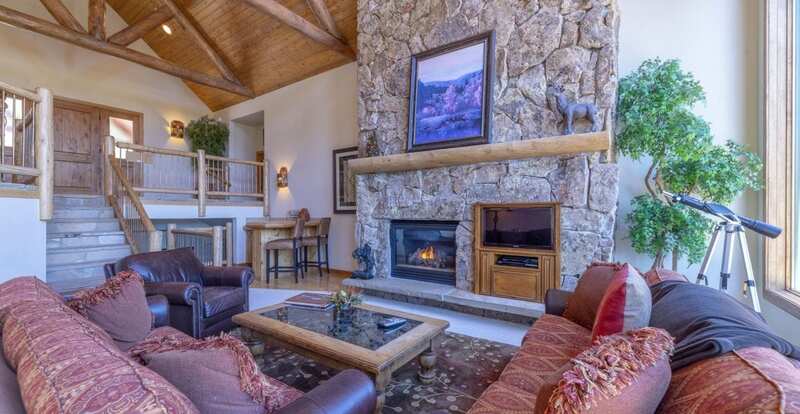 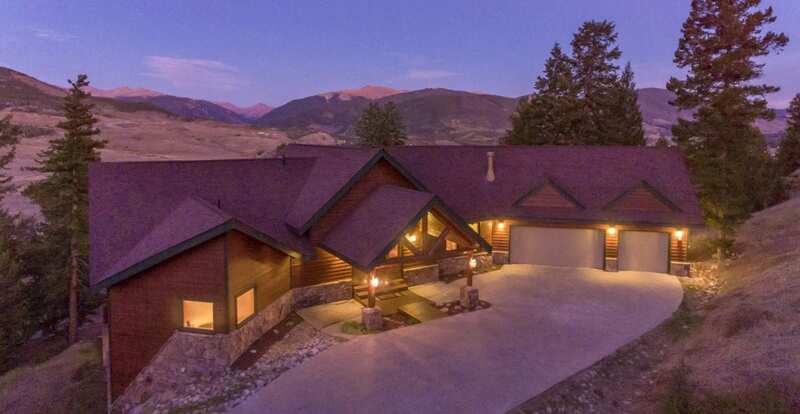 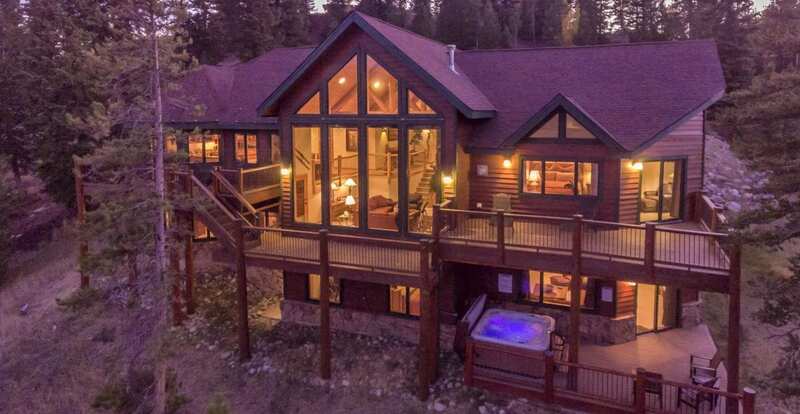 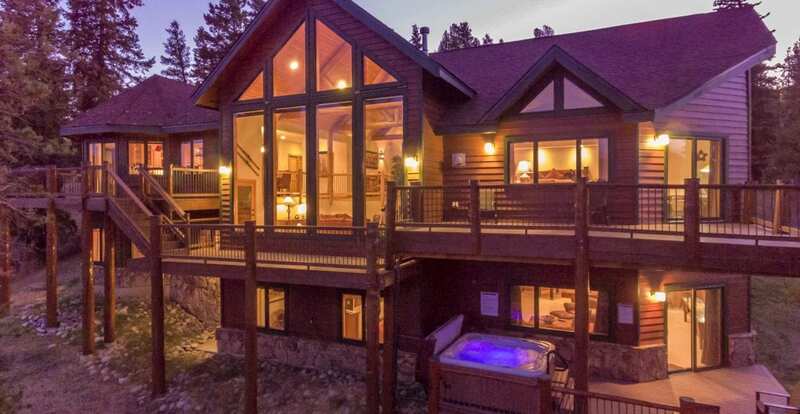 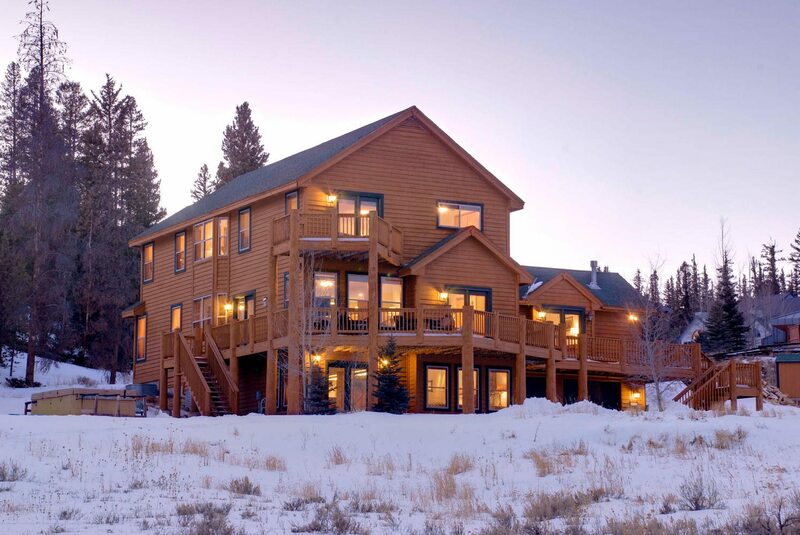 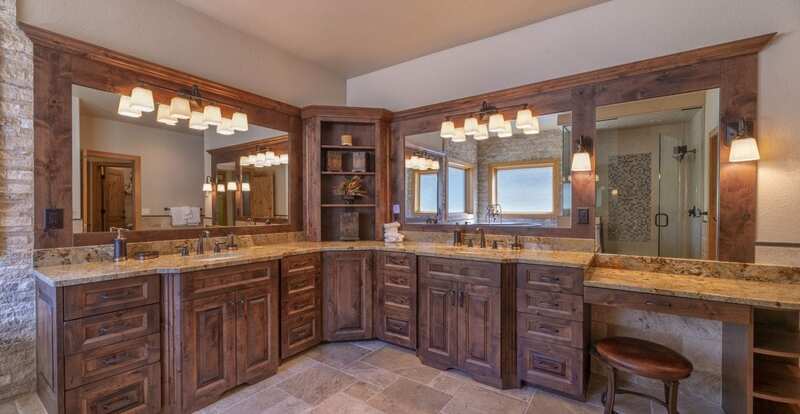 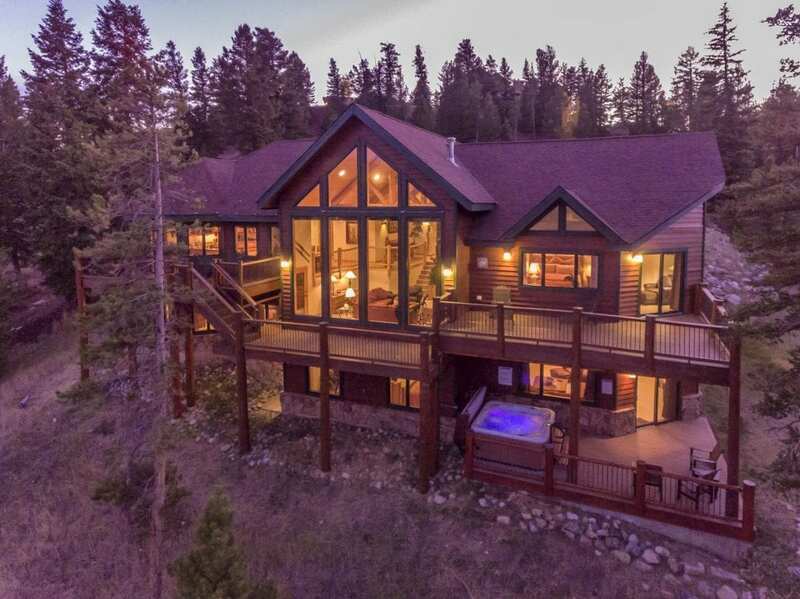 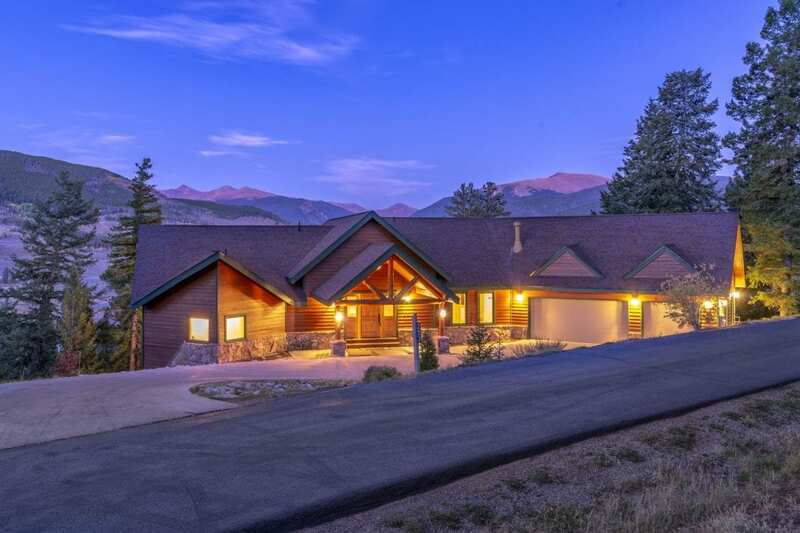 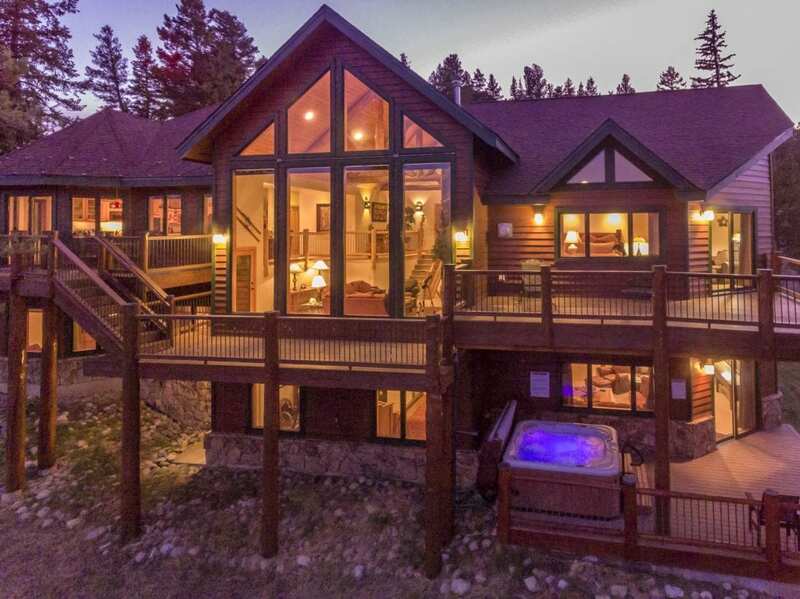 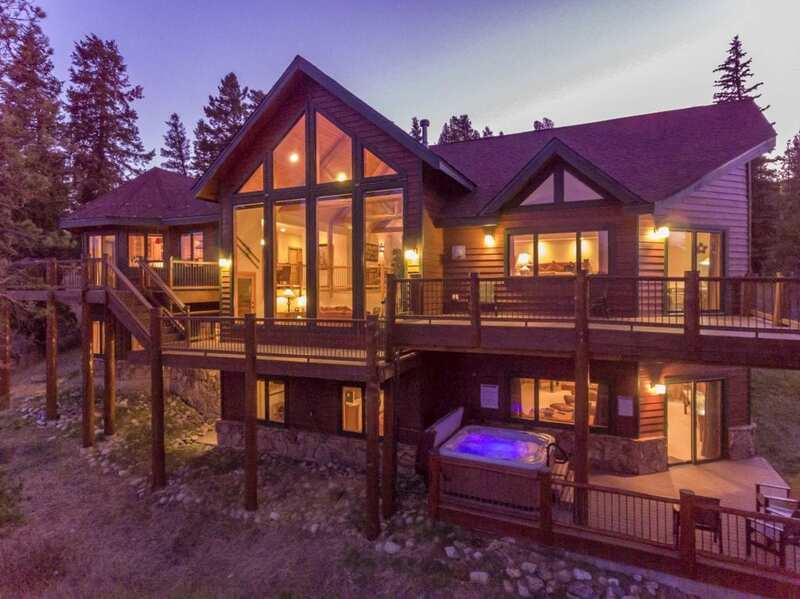 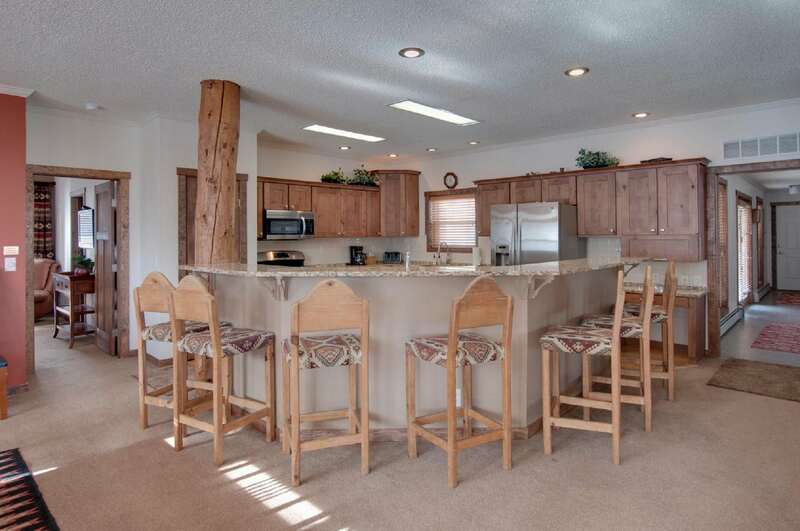 This is the most popular and largest Keystone vacation home in our inventory. About 5000 square feet. 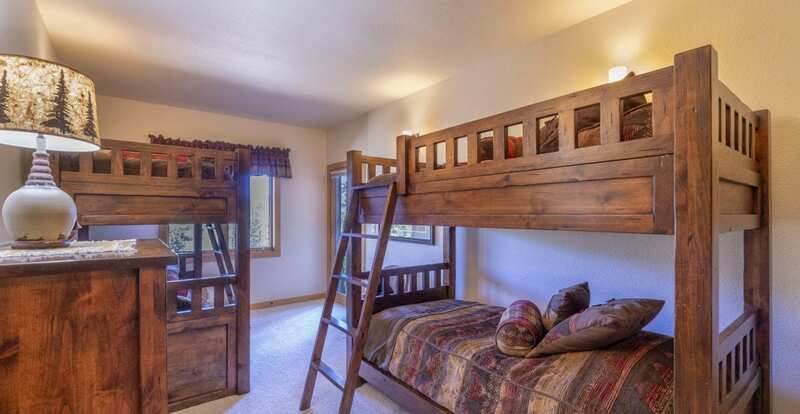 Sleeps up to 24-26 (2 Kings, 6 Queens, 2 Twins, 3 Queen sleeper sofas, and 2 portable twin futons) in its 8 bedrooms and 3 living rooms (11 sleeping areas). 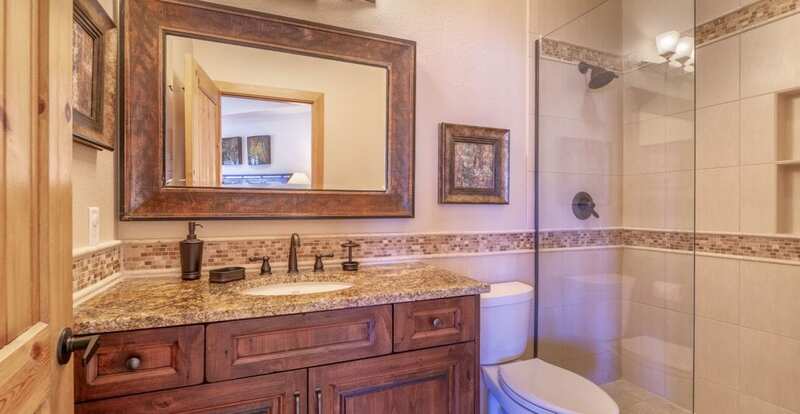 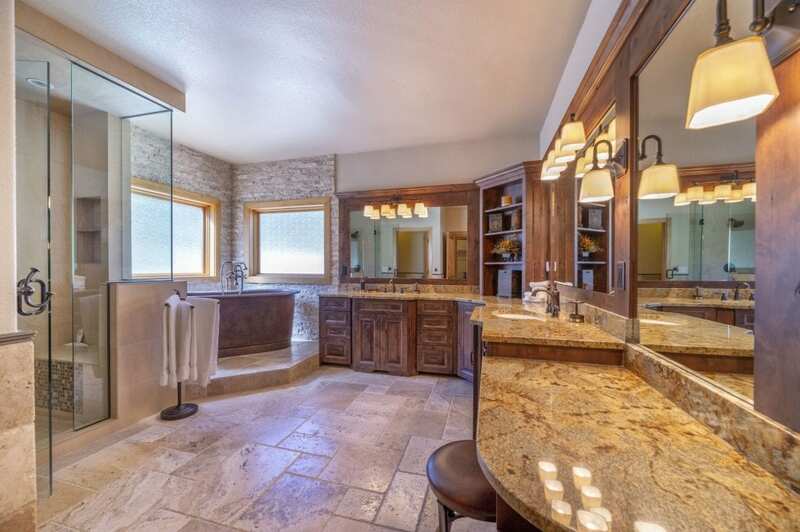 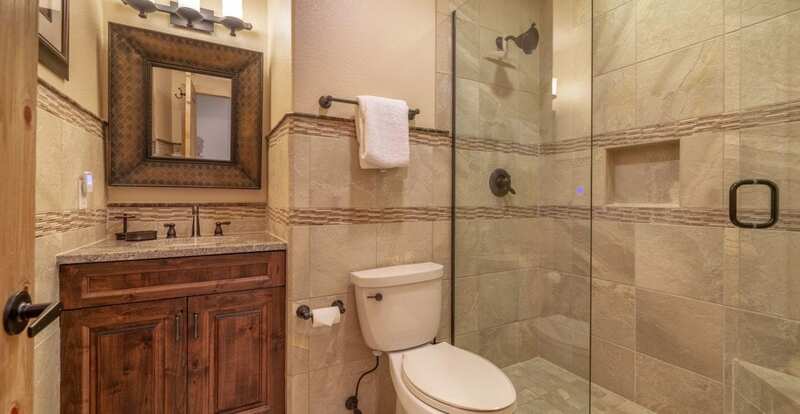 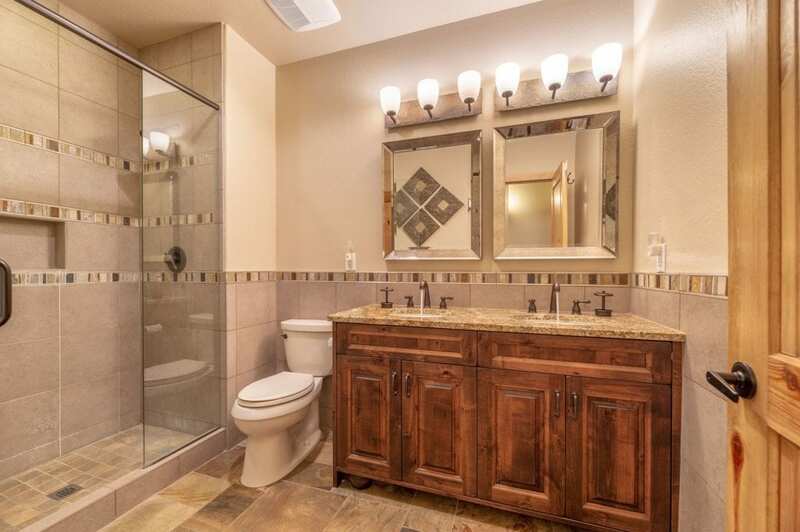 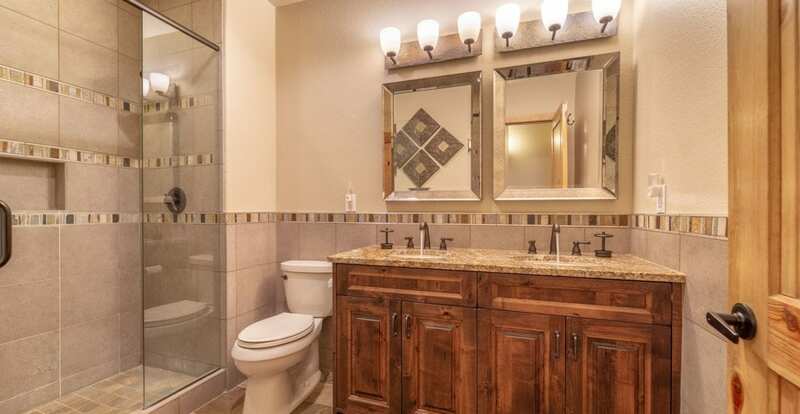 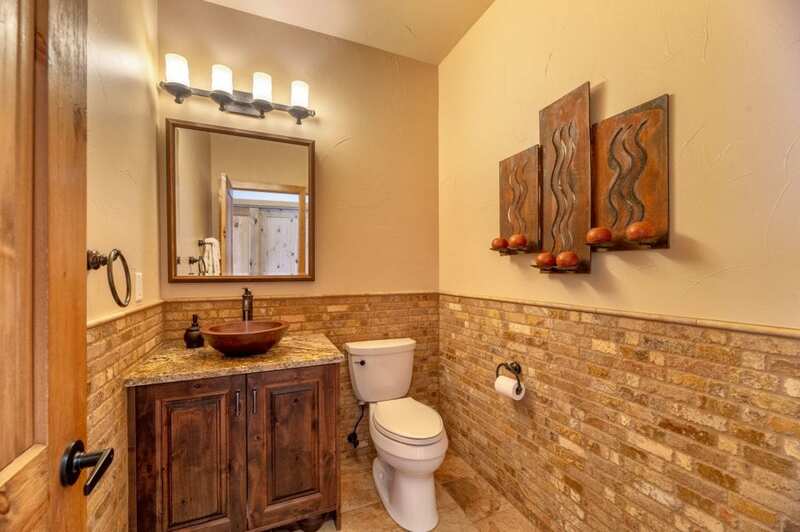 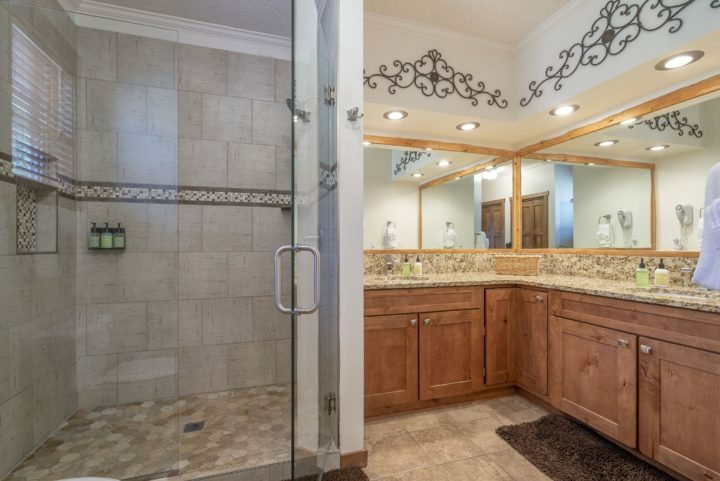 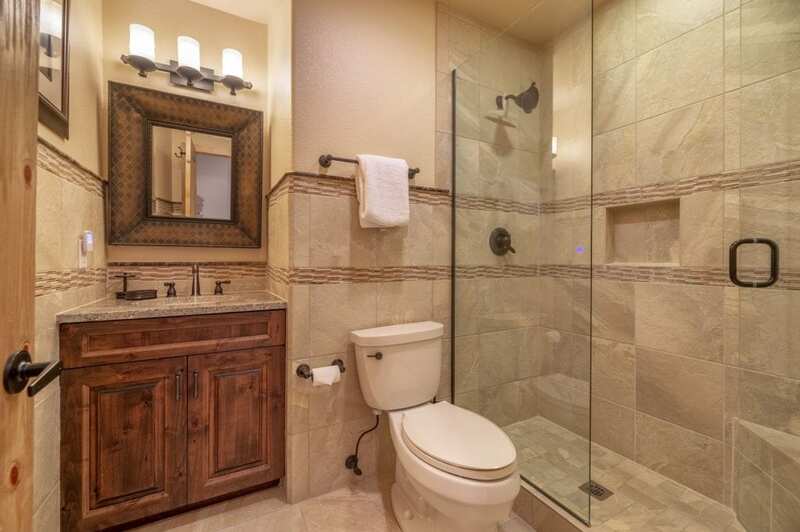 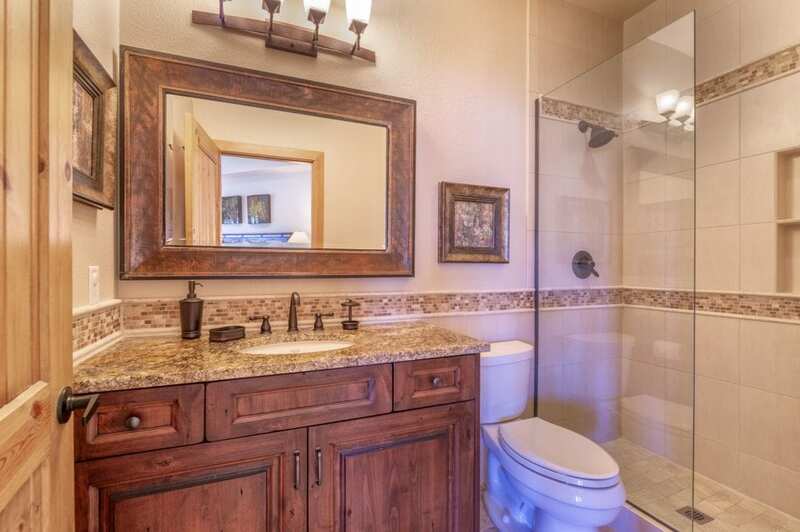 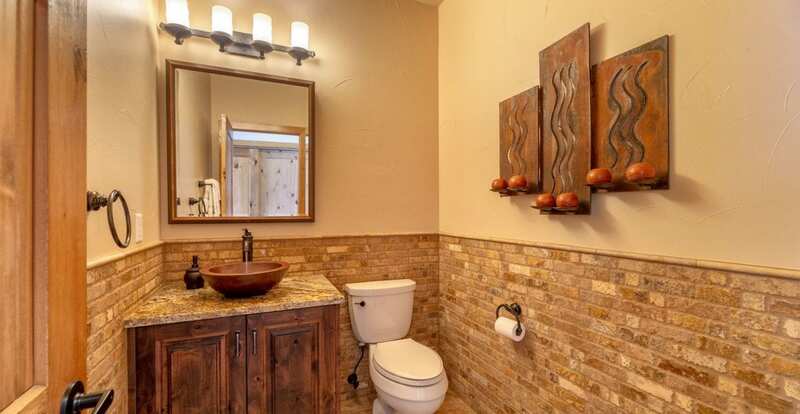 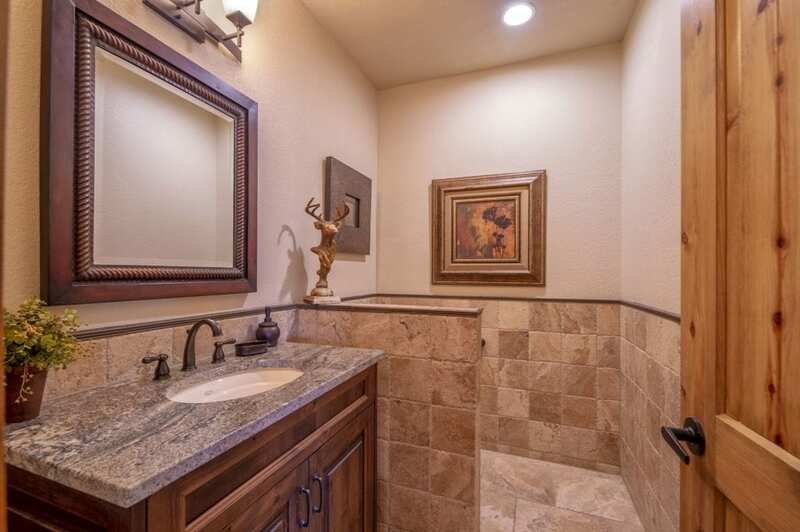 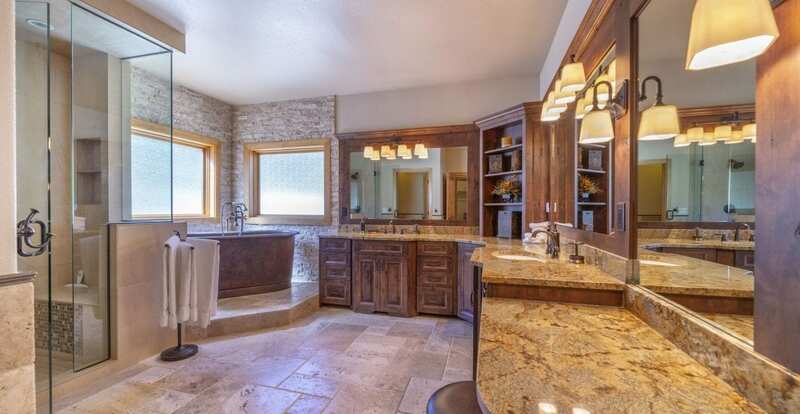 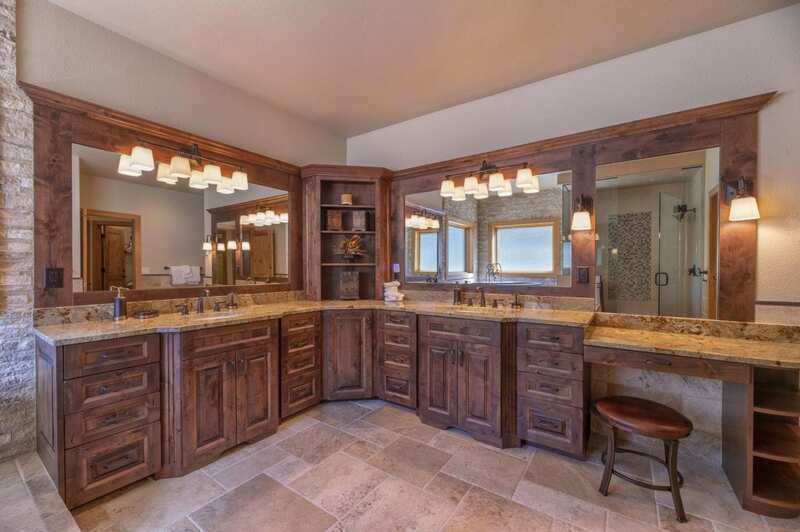 Also has 5 Baths. Located on about 1 acre of land. 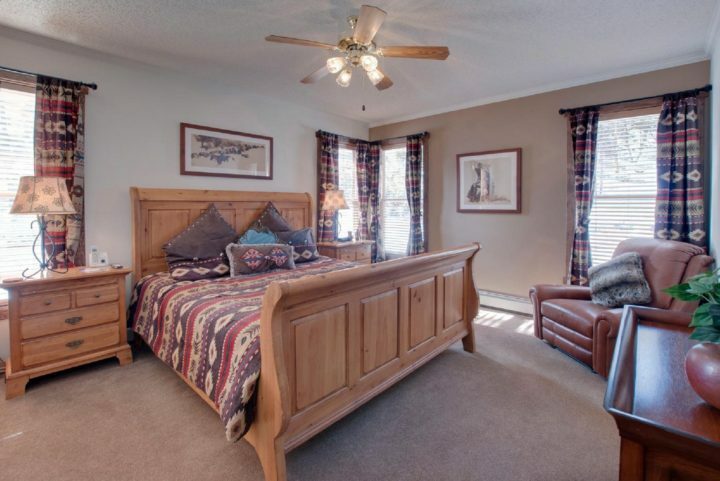 Professionally decorated with Broyhill and Kincaid furnishings. 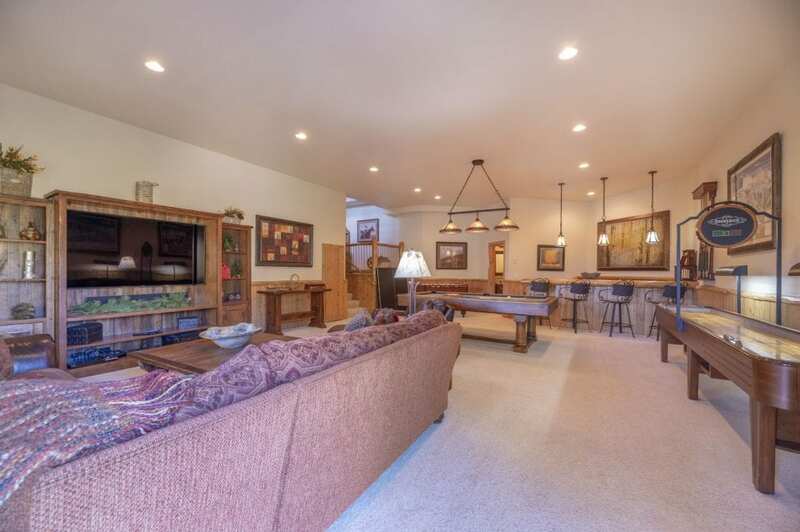 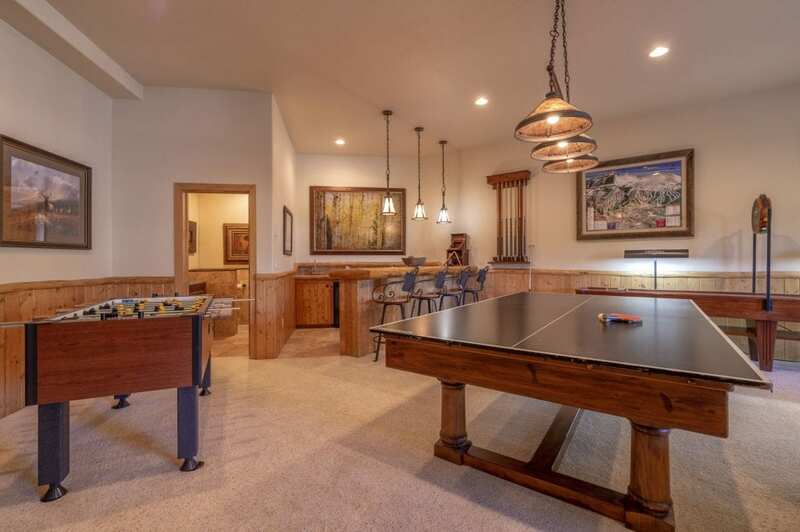 Features include an oversize heated garage, stone fireplace, 55″ big screen TV, additional HDTVs, pool table, foosball table, 2 laundry areas with washer/dryers, free WiFi, 3 large family rooms, 2 kitchens (4 sinks/3 dishwashers/3 refrigerators), and seated dining for 24 people in the same room (12 at the 10´ dining room trestle table, 8 more at the kitchen eating bar, and 4 at the nearby game table—with additional tables on the other 2 levels). 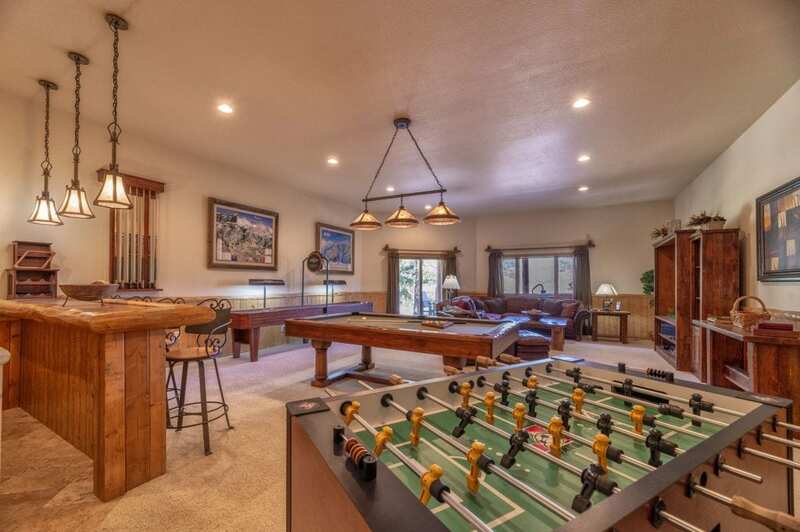 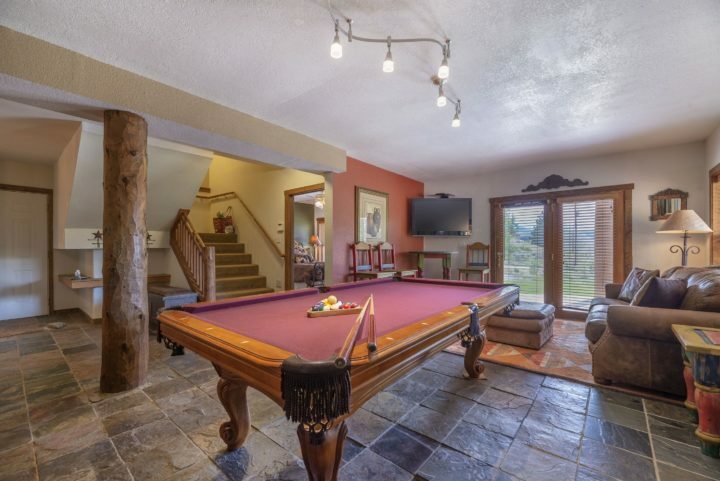 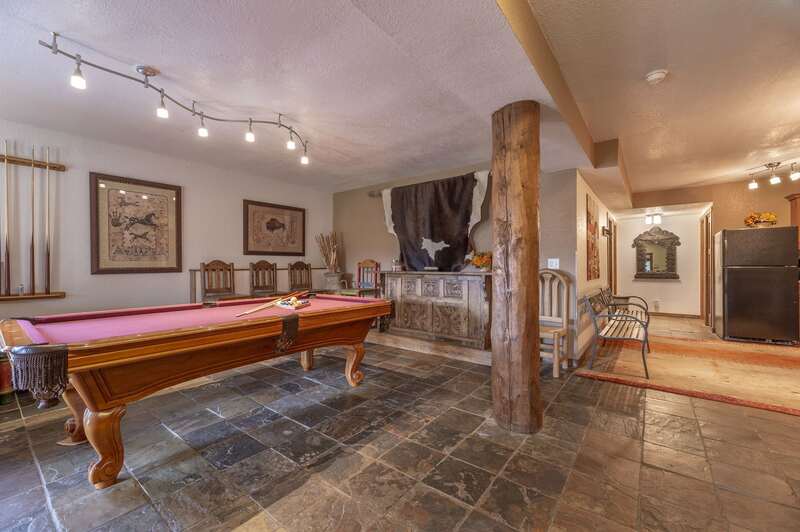 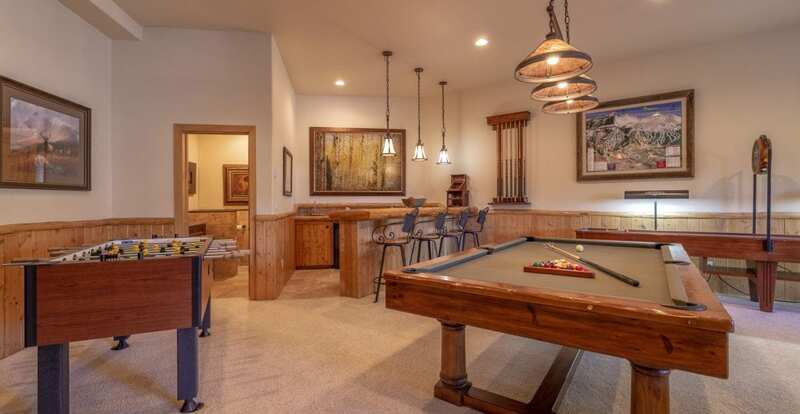 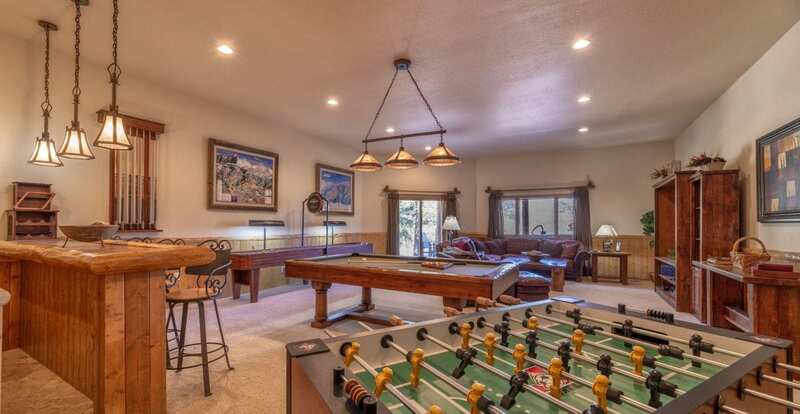 Full-size pool table and foosball table. Handicap access ramp (no steps) to the main living area (plus one ADA bath). 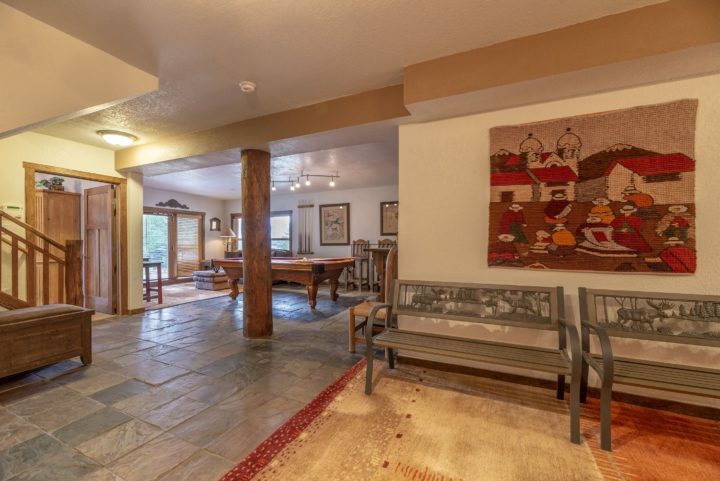 Outside there are two paved driveways, three large decks on three levels (plus 5 outdoor dining tables), a gas BBQ, a sledding hill on site (sleds provided), and a 10´ long private hot tub ($12,000 tub) which allows guests to enjoy a secluded mountain view (including Keystone night skiing lights). 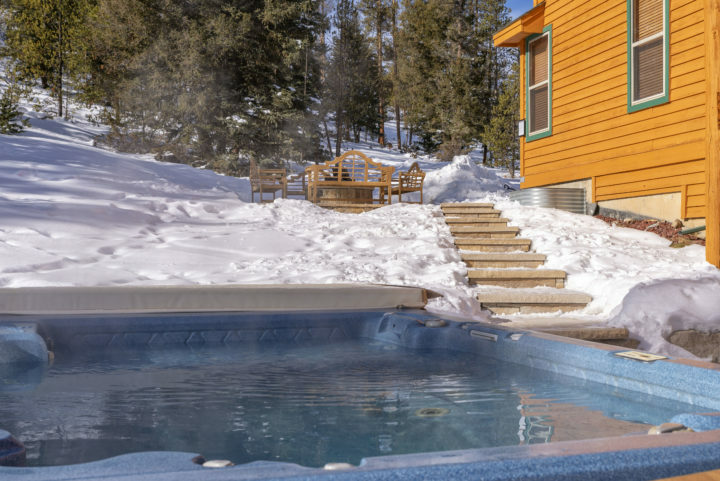 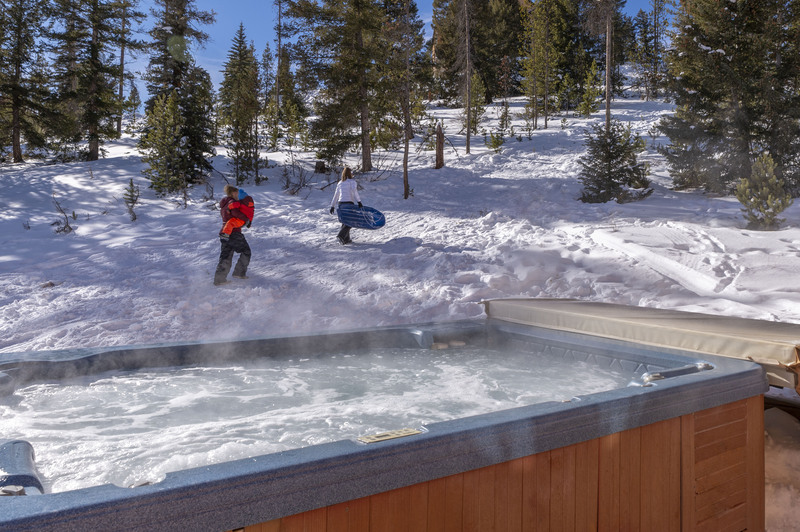 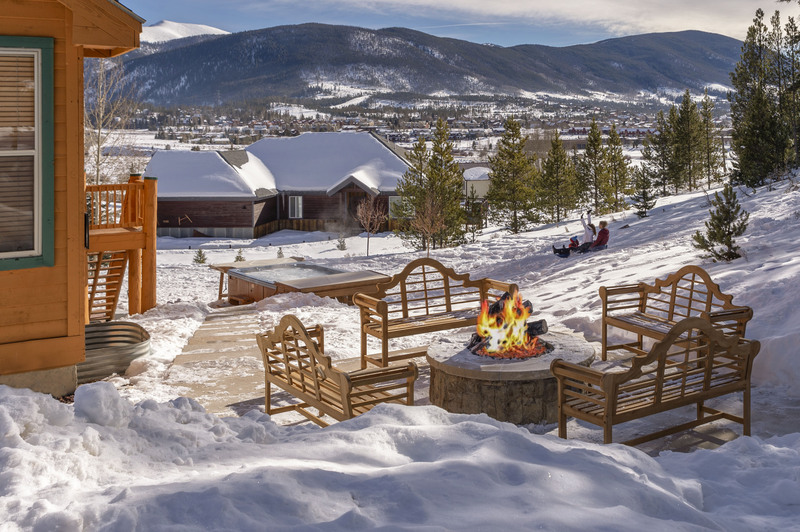 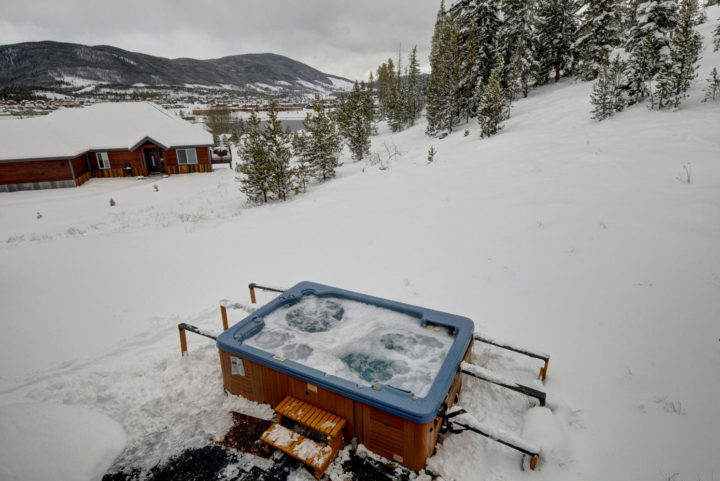 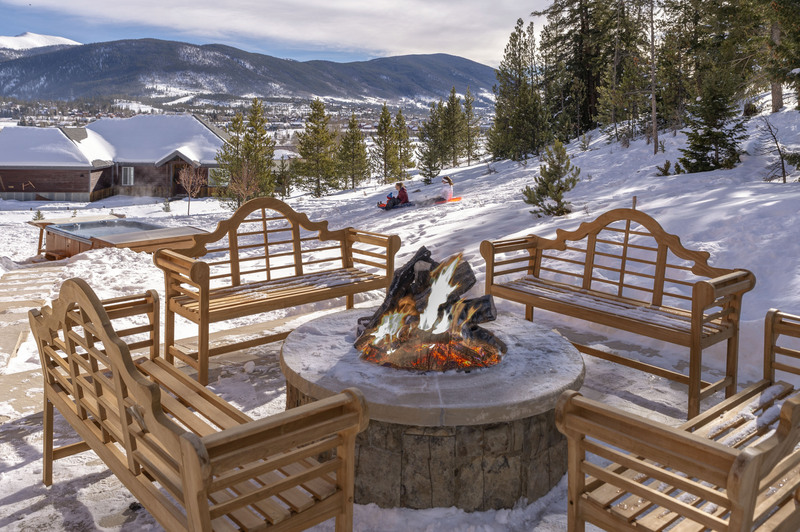 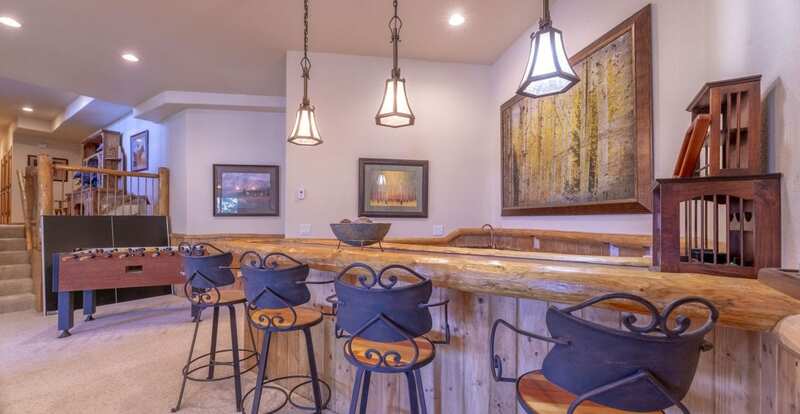 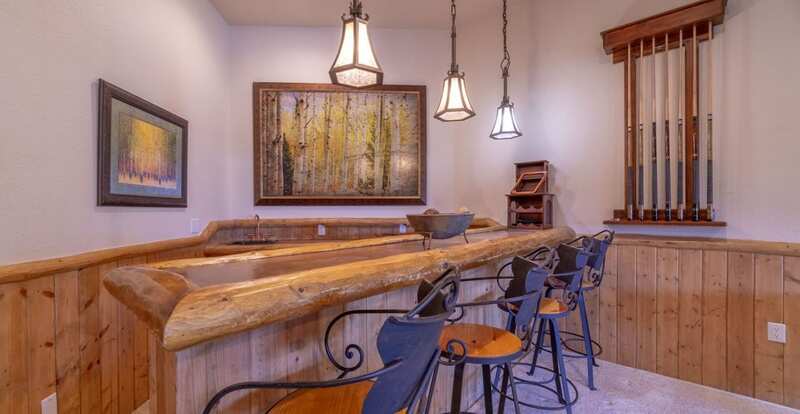 In addition, we’ve added a 12-seat fire pit overlooking the hot tub and sledding hill area. 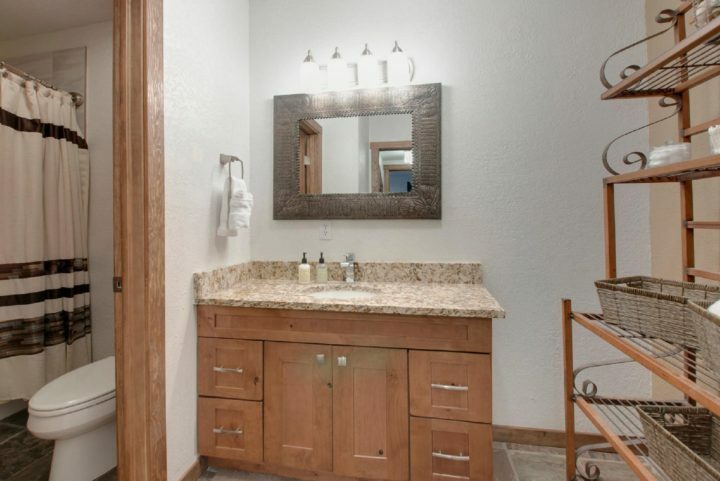 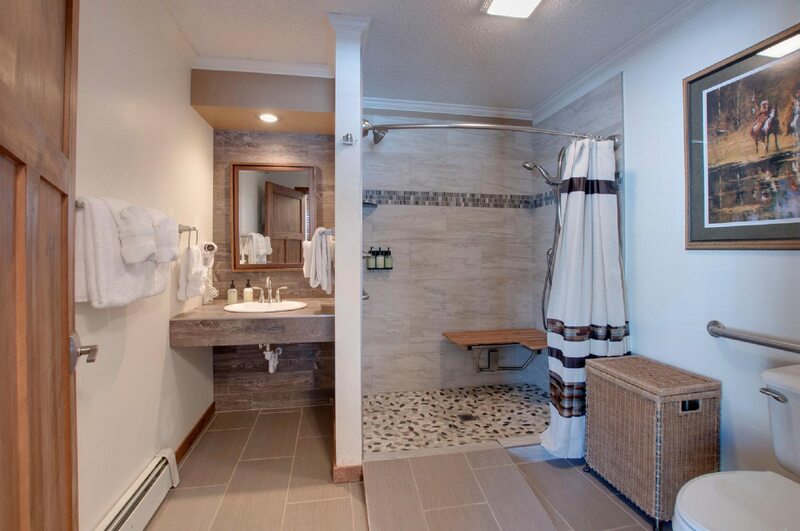 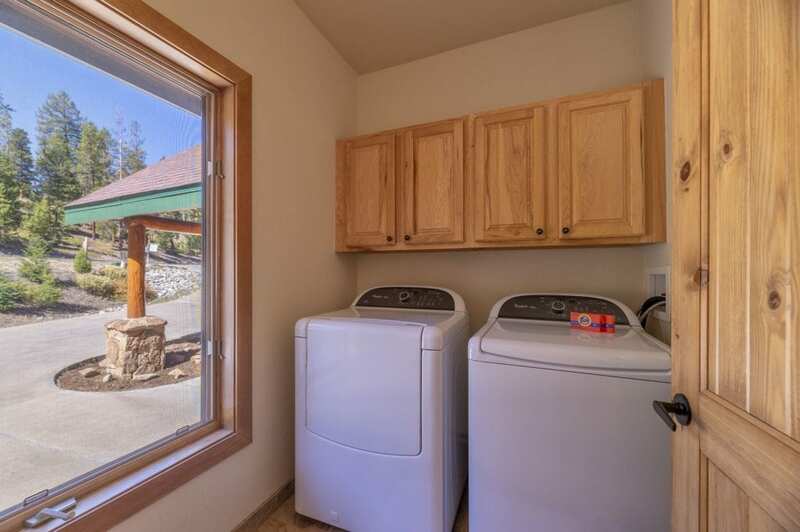 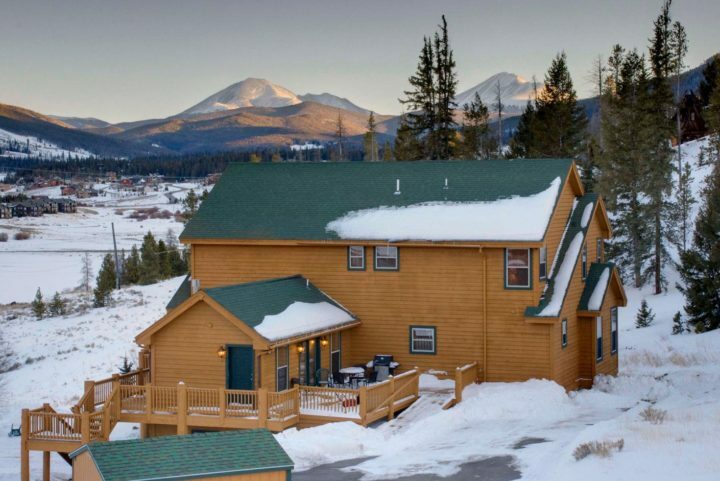 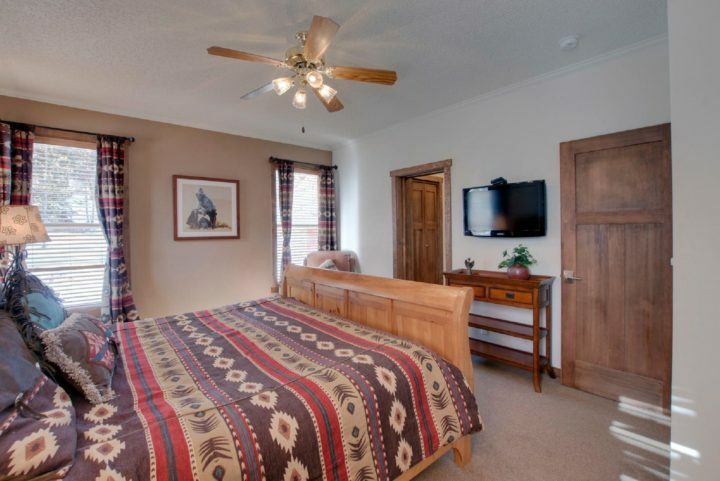 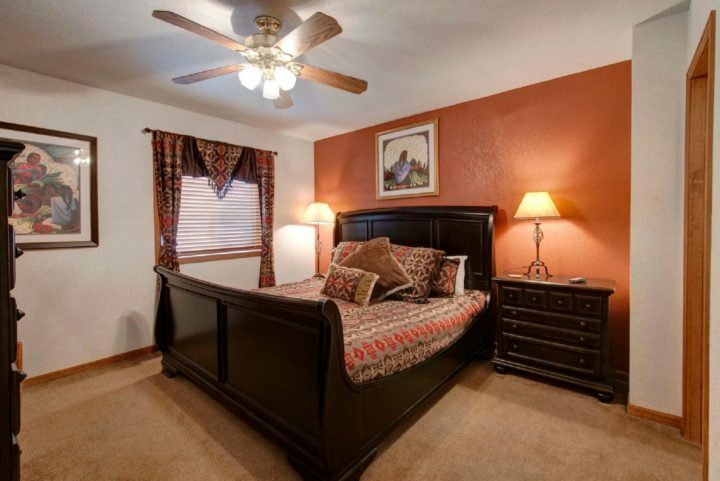 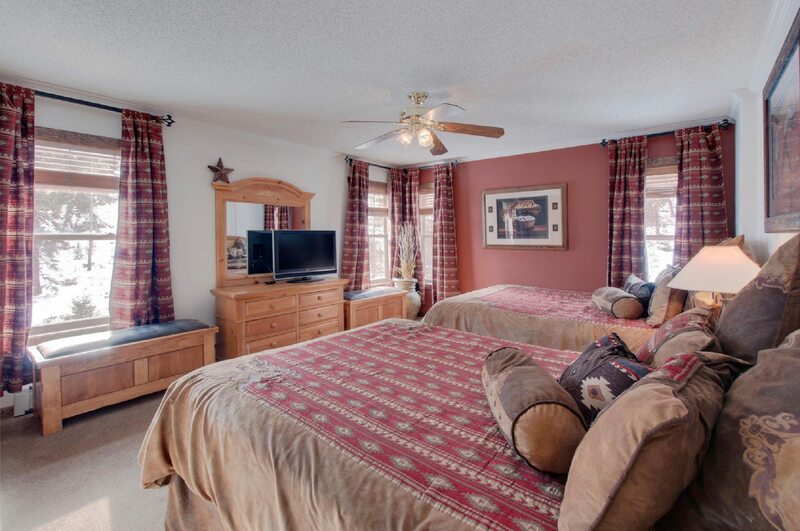 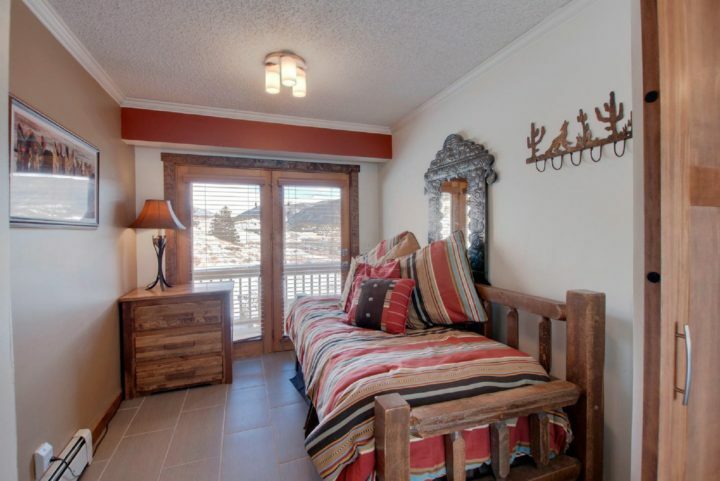 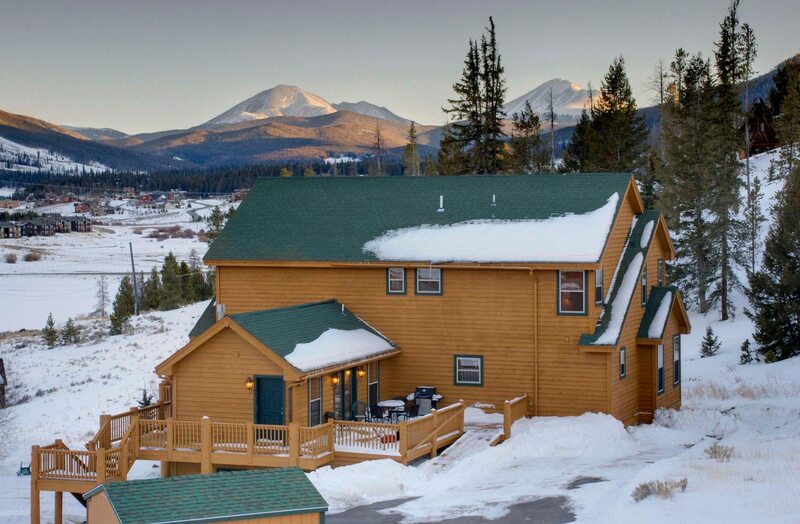 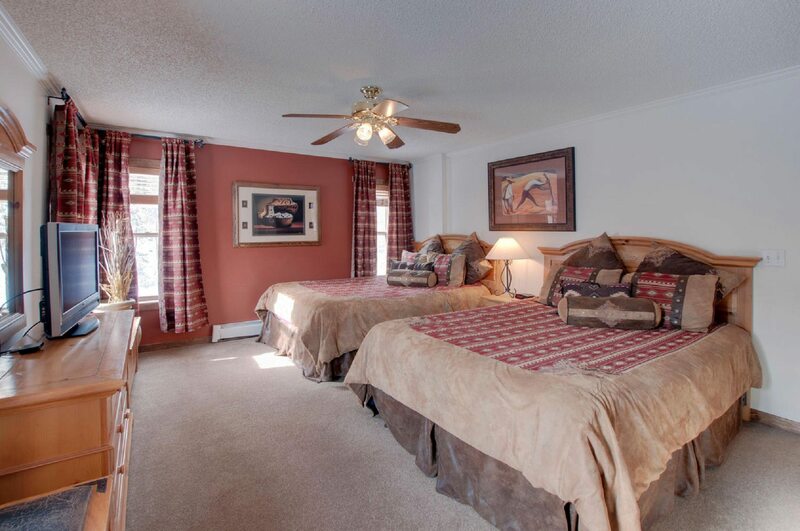 If you want the feel of living in a spacious mountain retreat with amenities for all ages, this is the place! 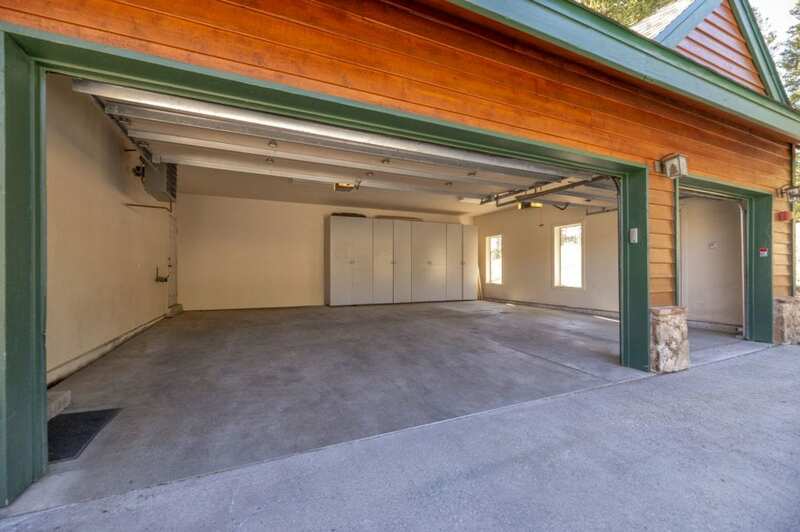 Level 1—Two-car garage (access from lower driveway). 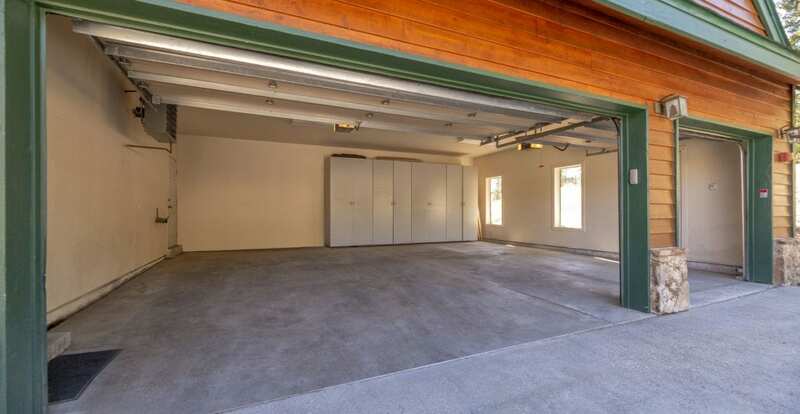 Level 2—Access from upper driveway (with no steps). 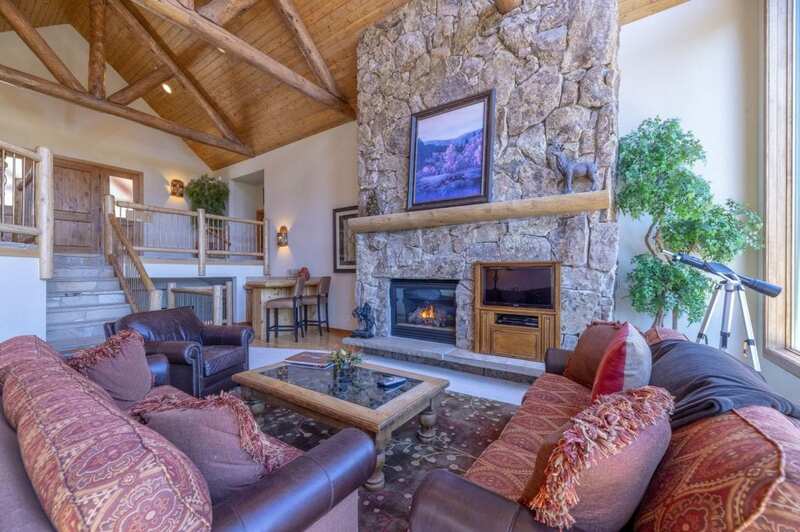 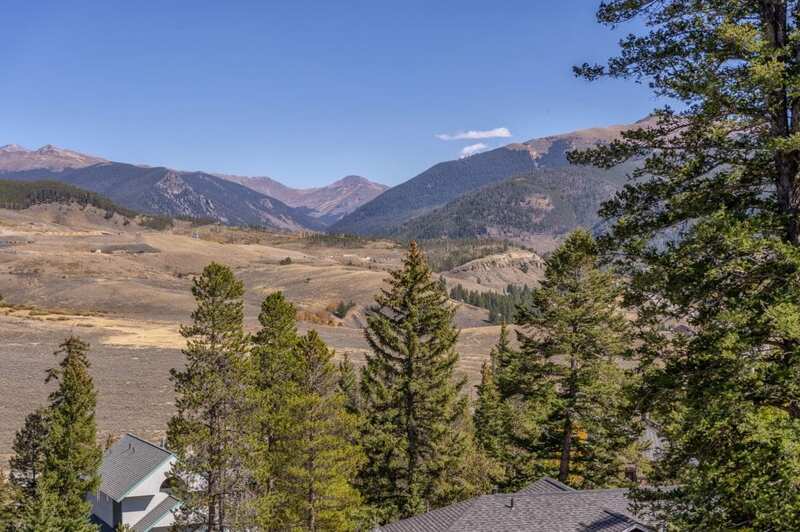 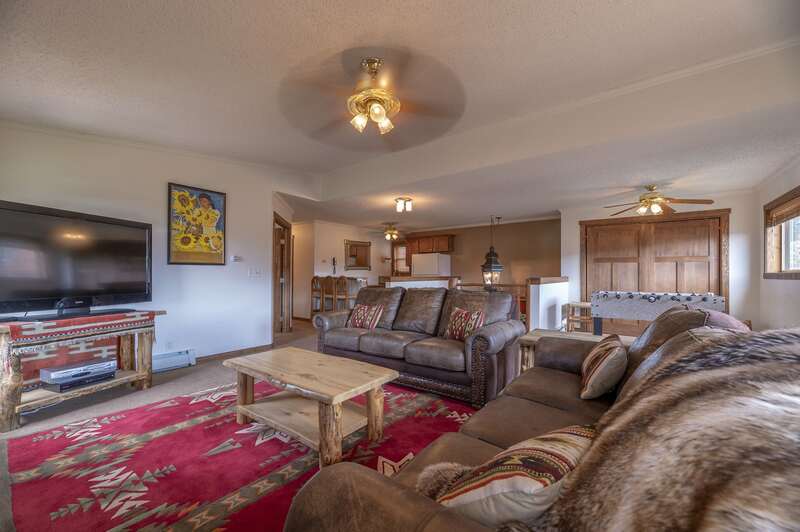 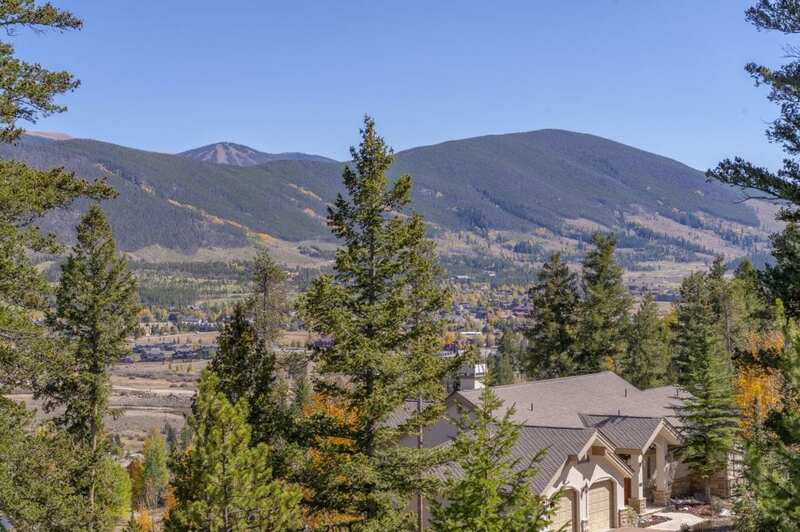 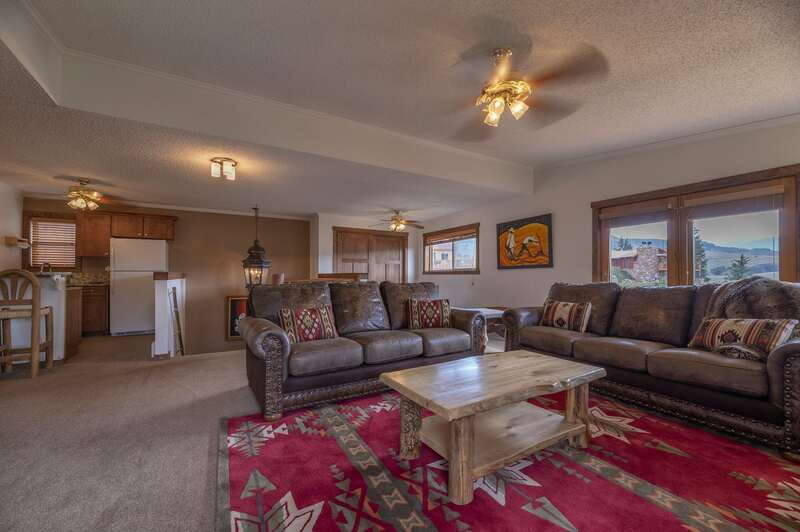 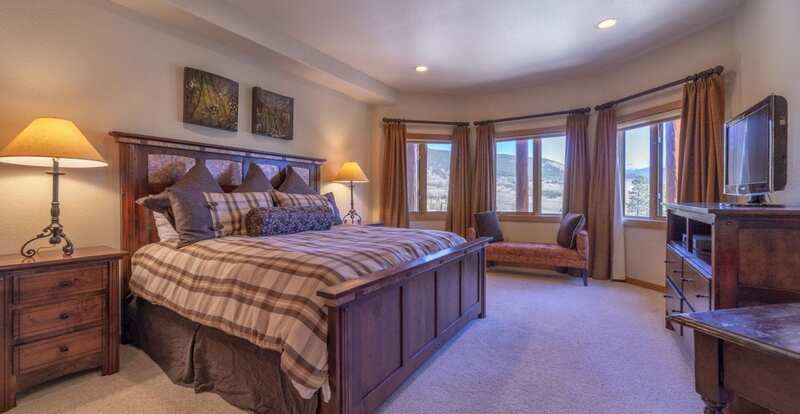 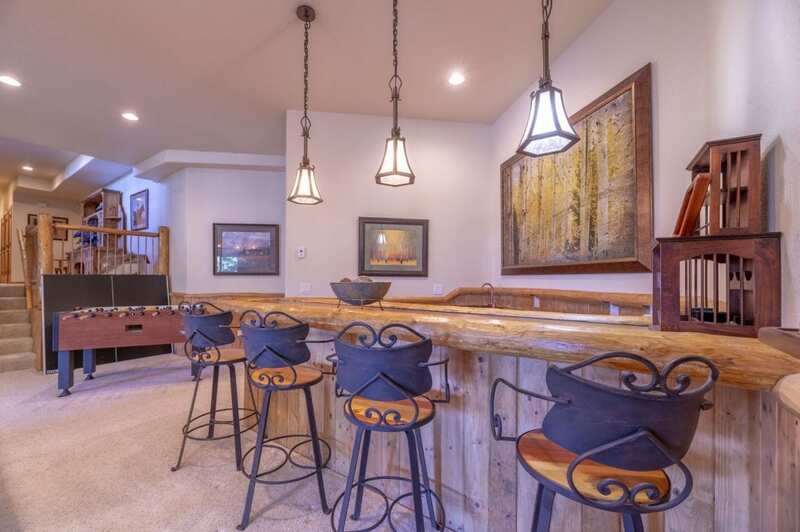 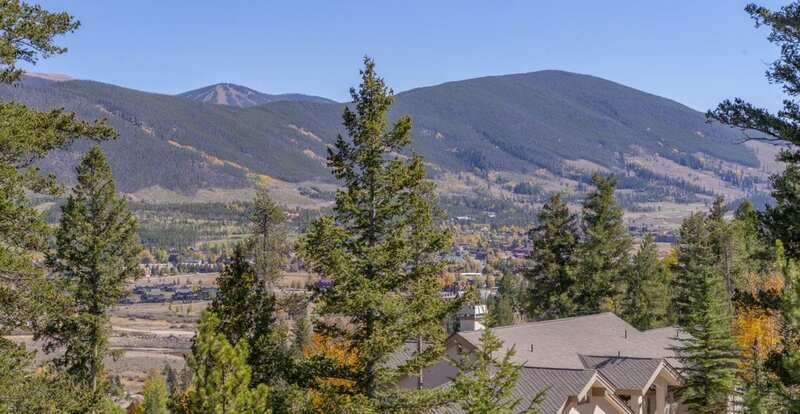 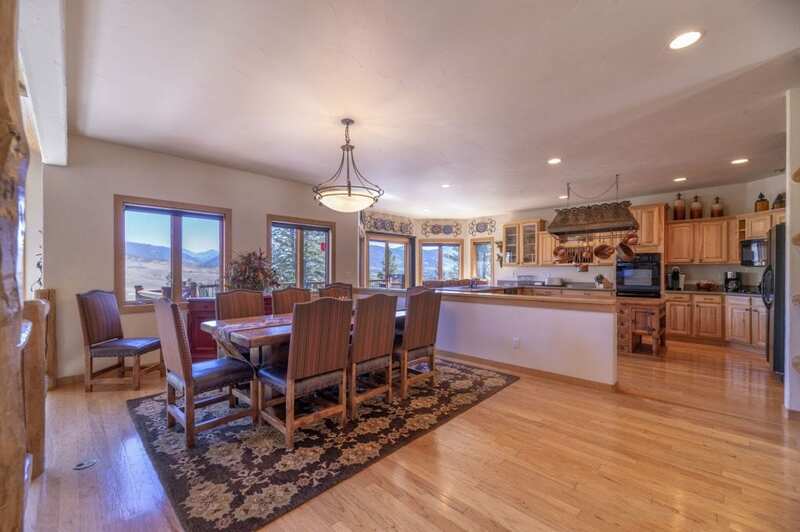 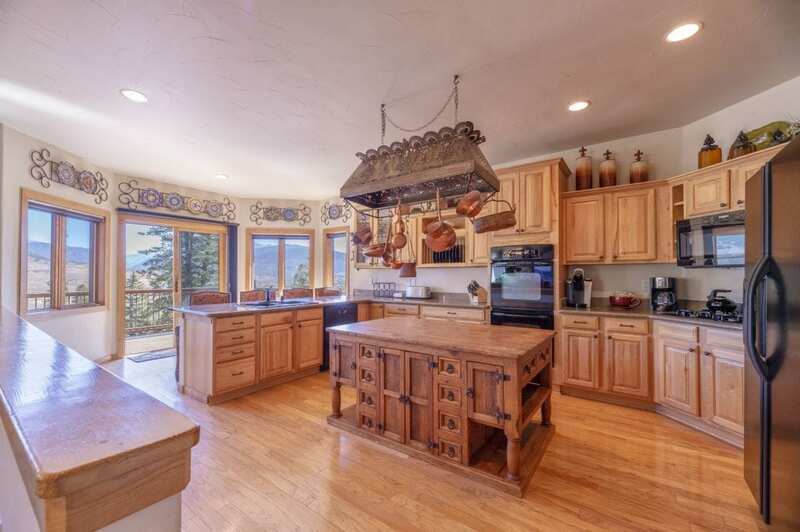 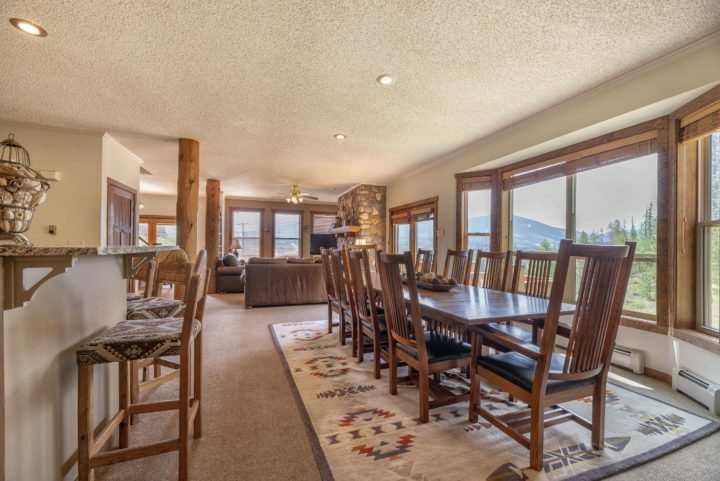 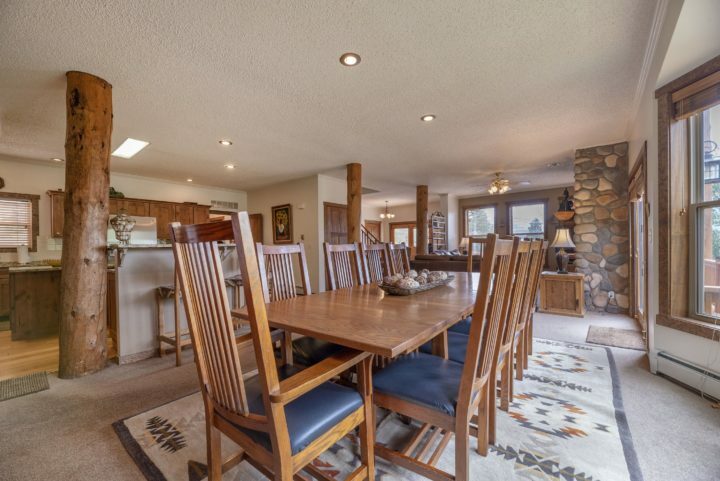 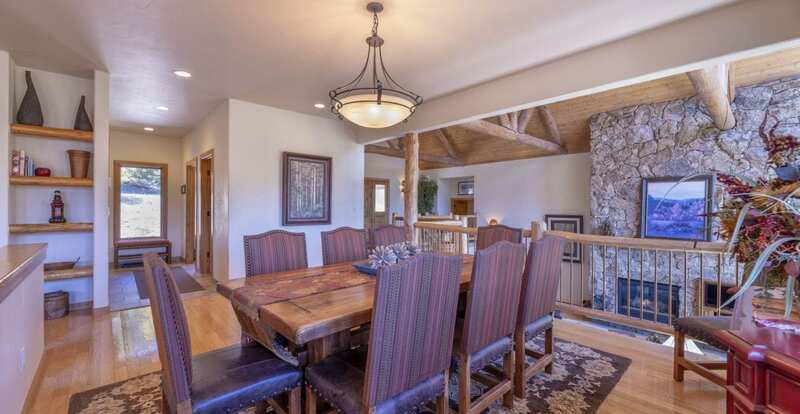 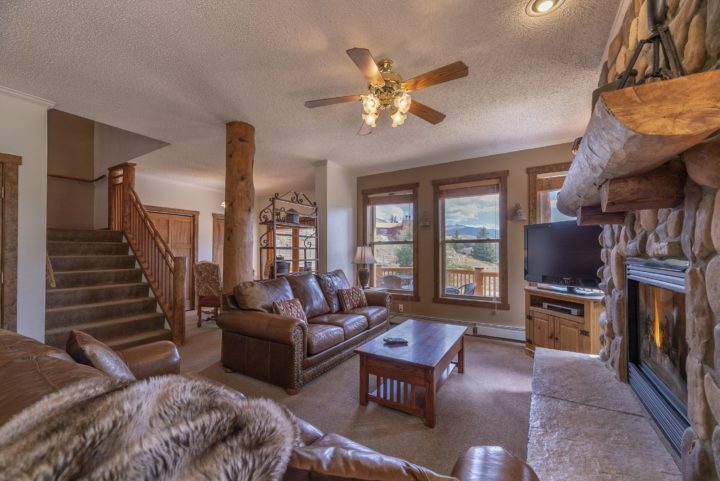 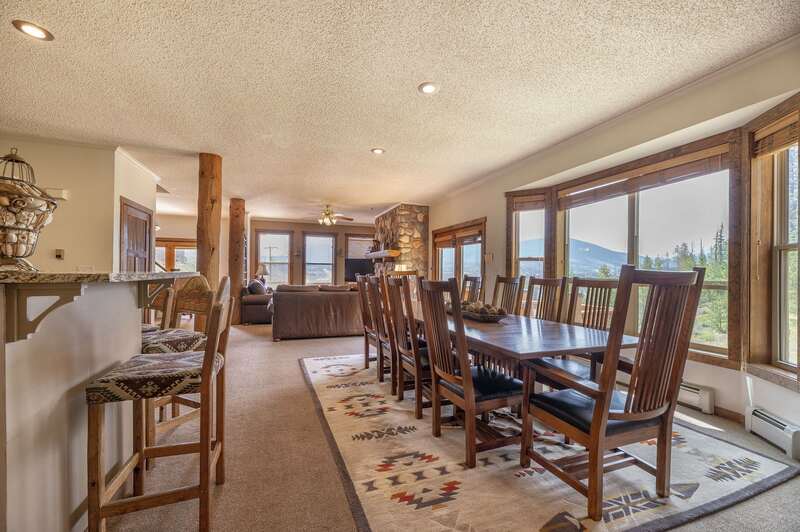 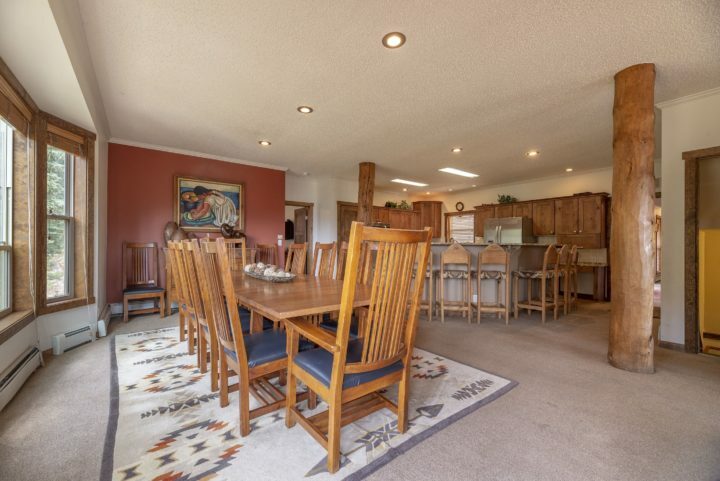 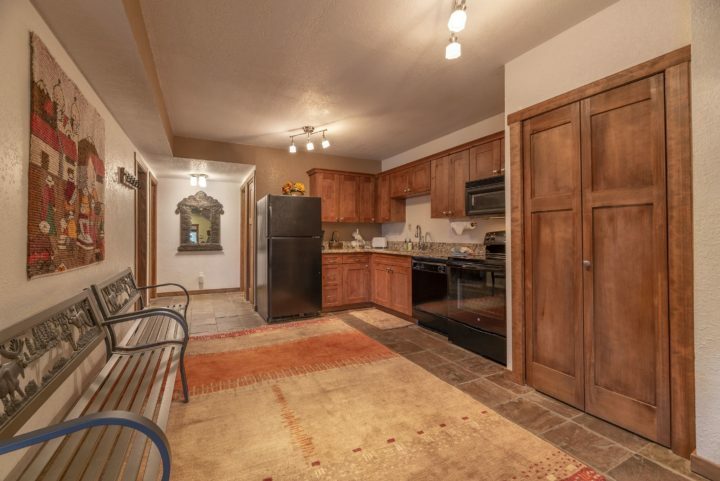 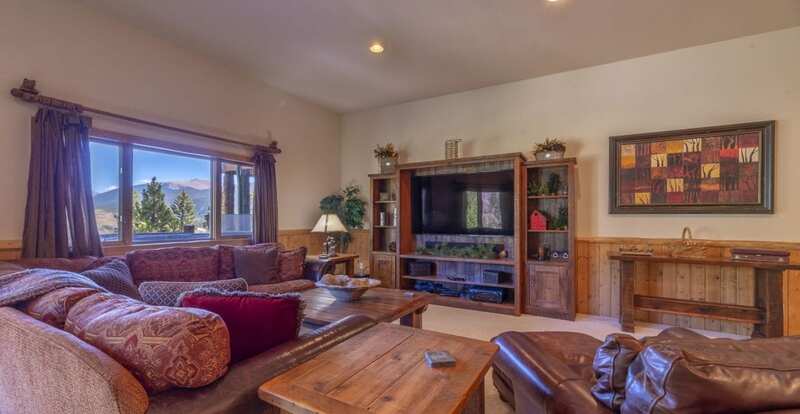 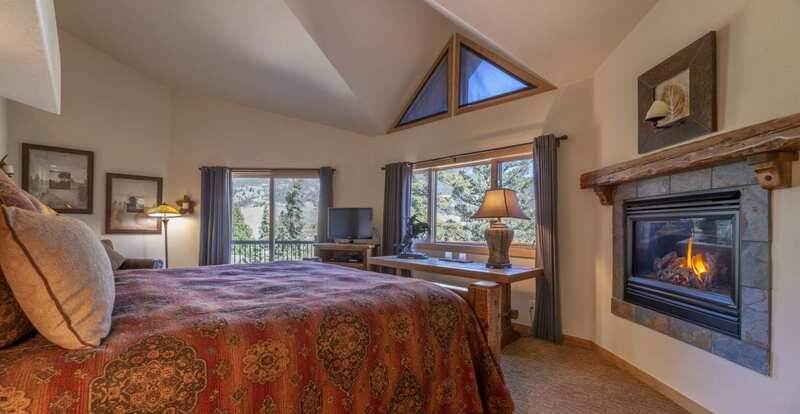 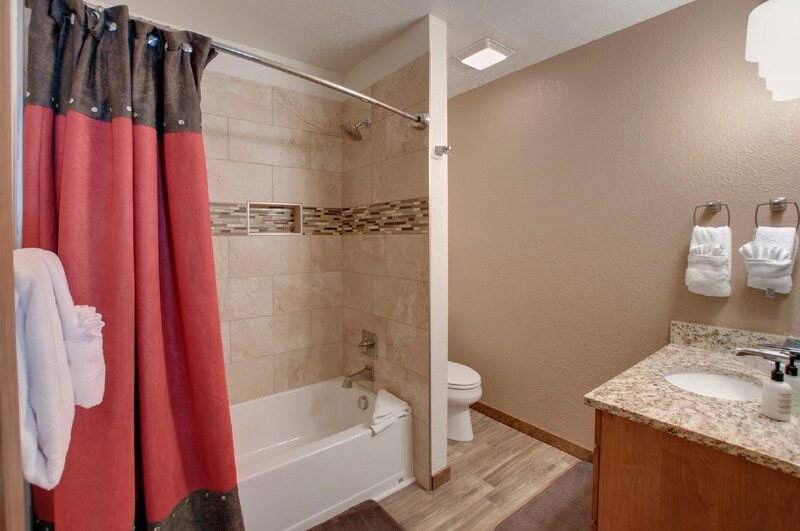 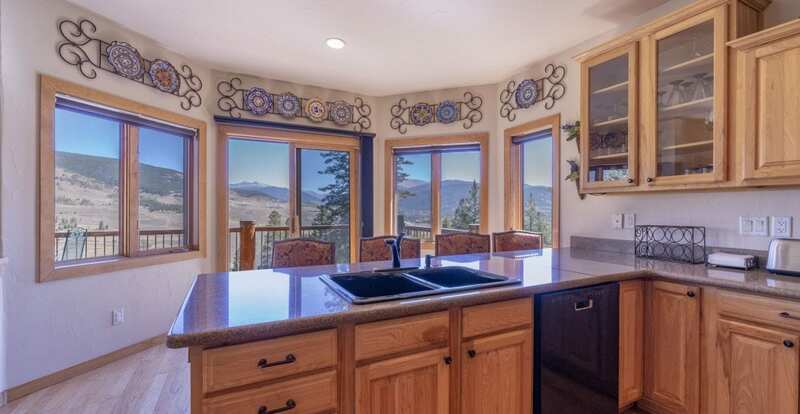 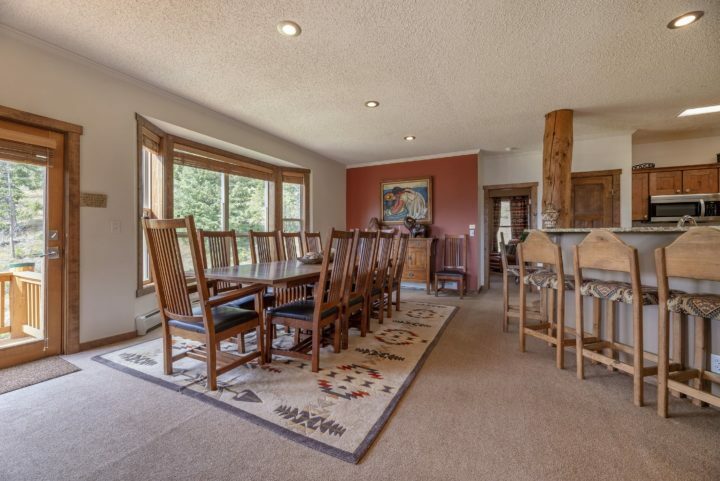 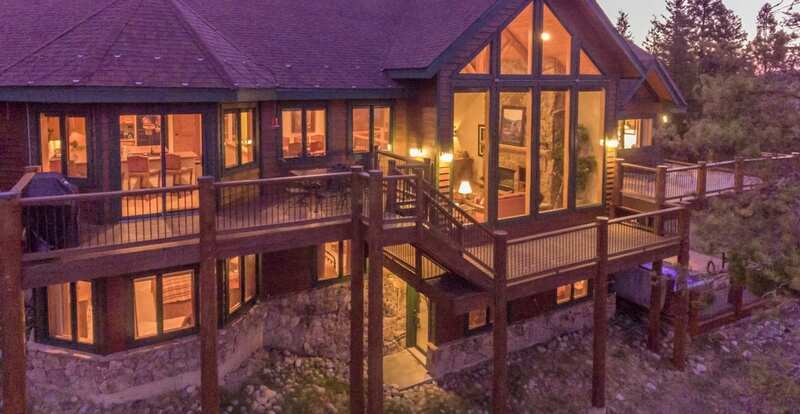 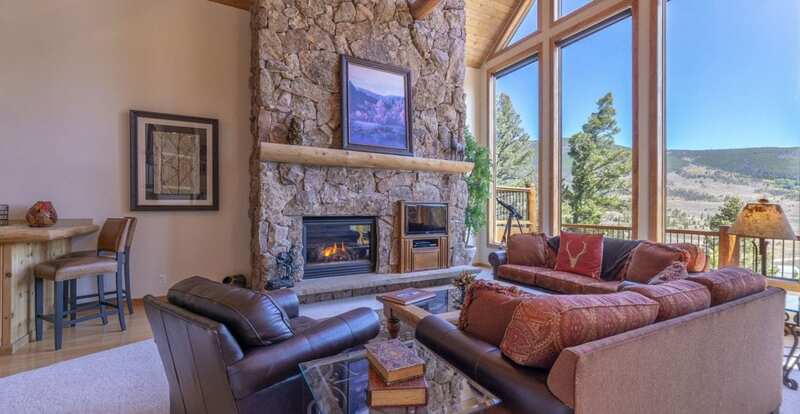 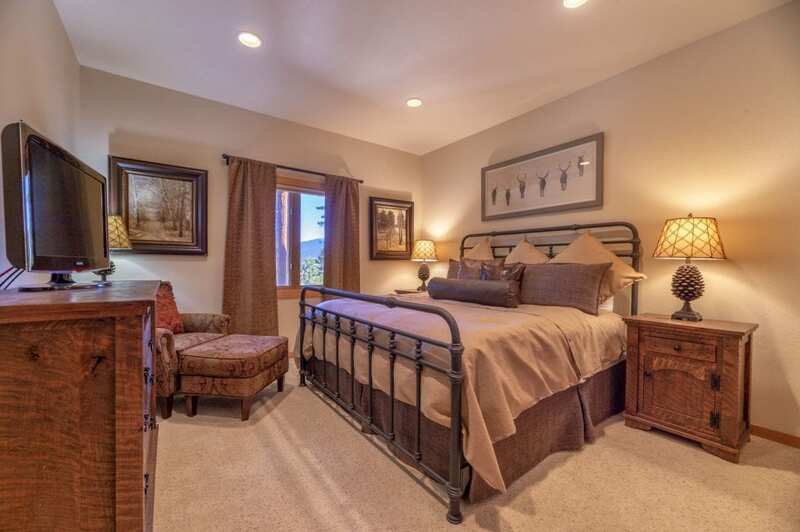 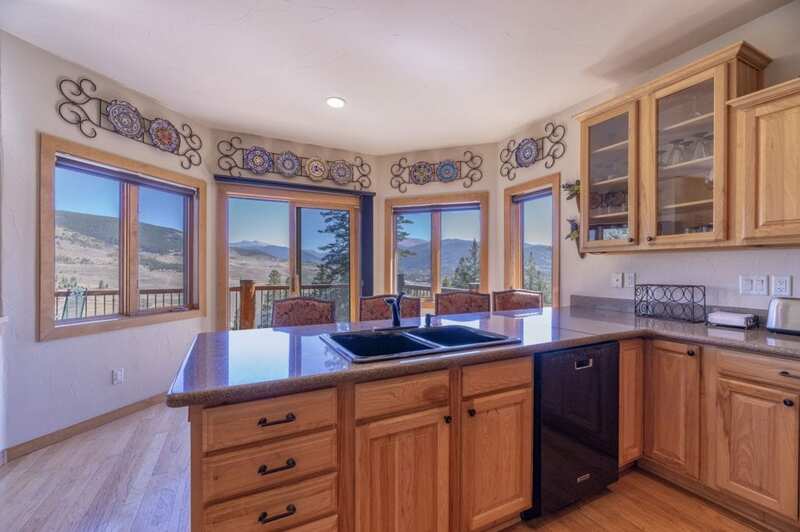 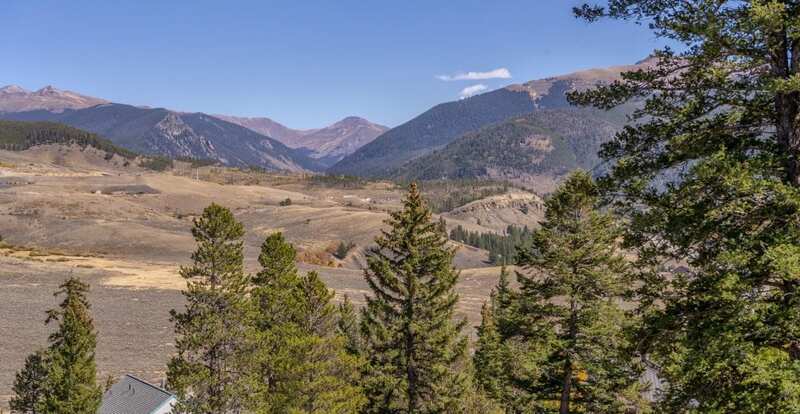 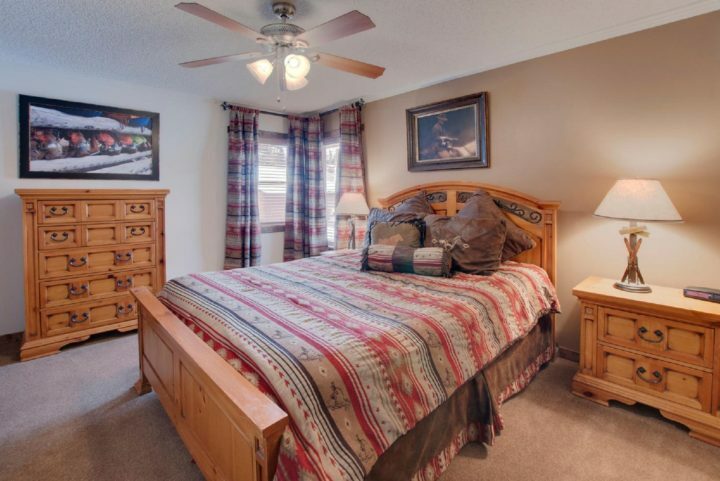 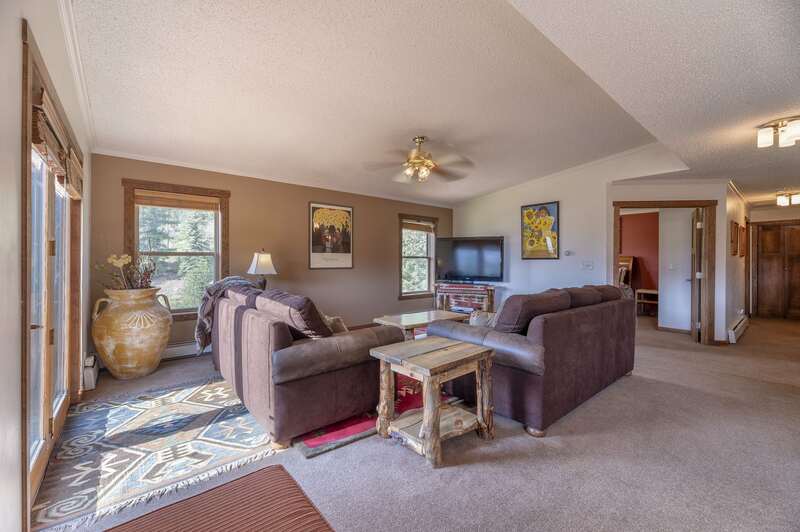 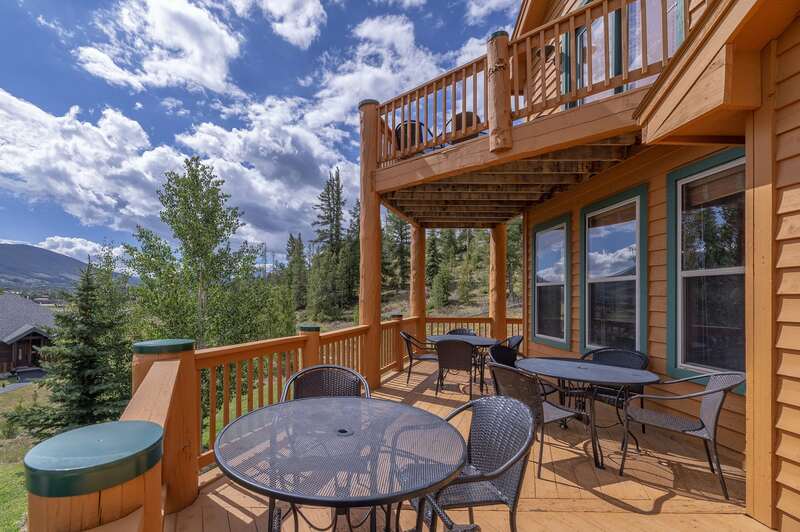 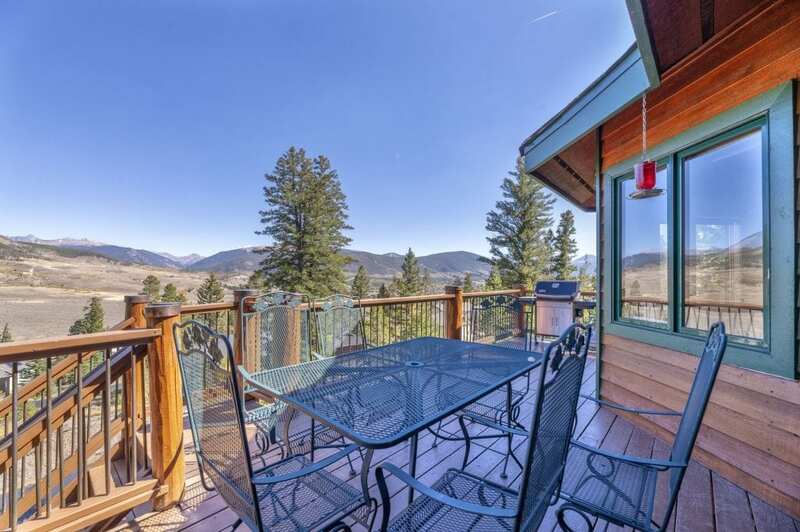 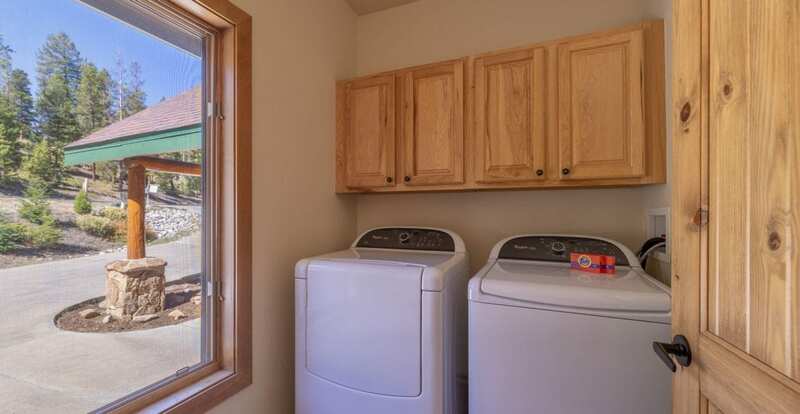 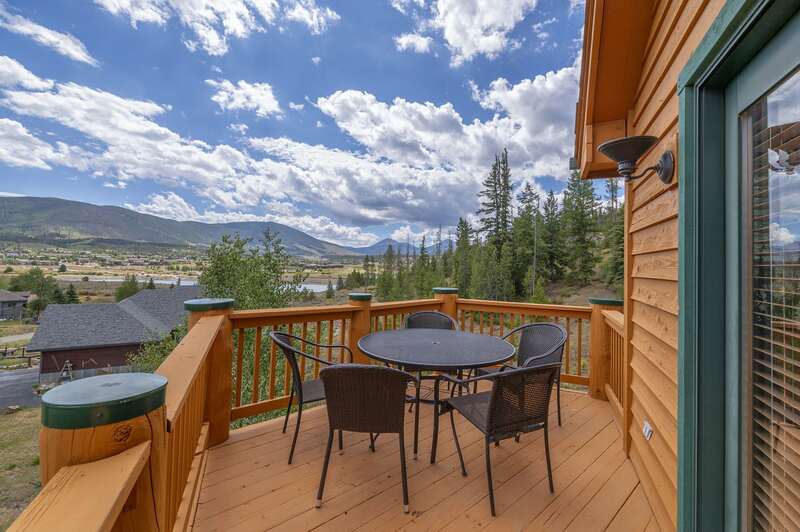 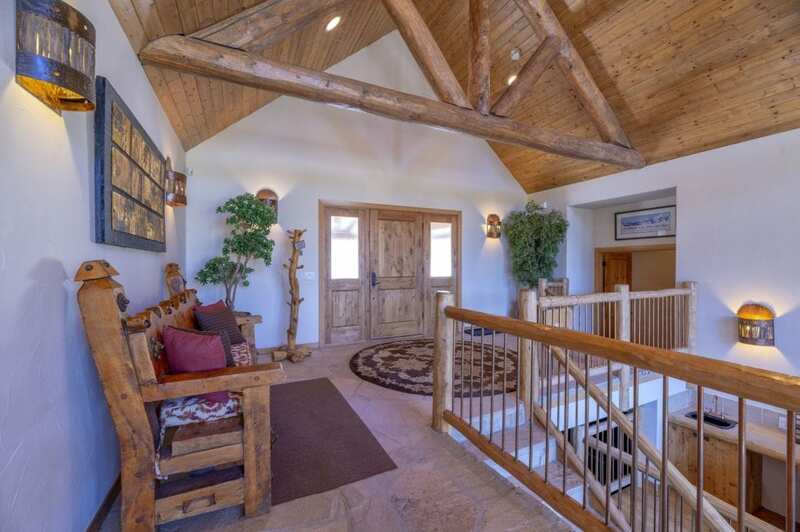 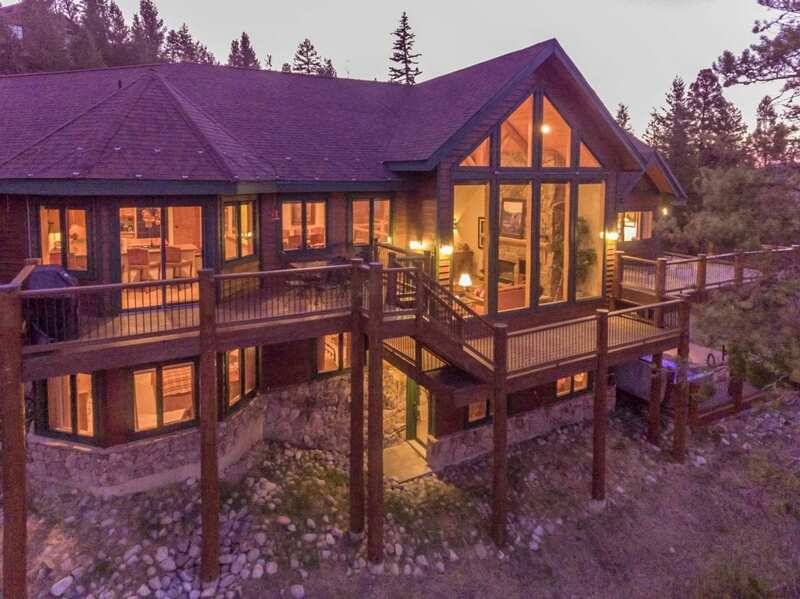 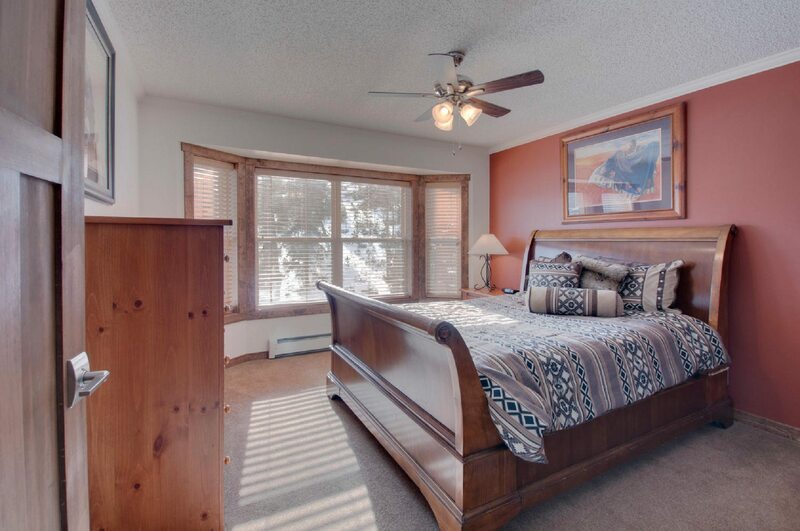 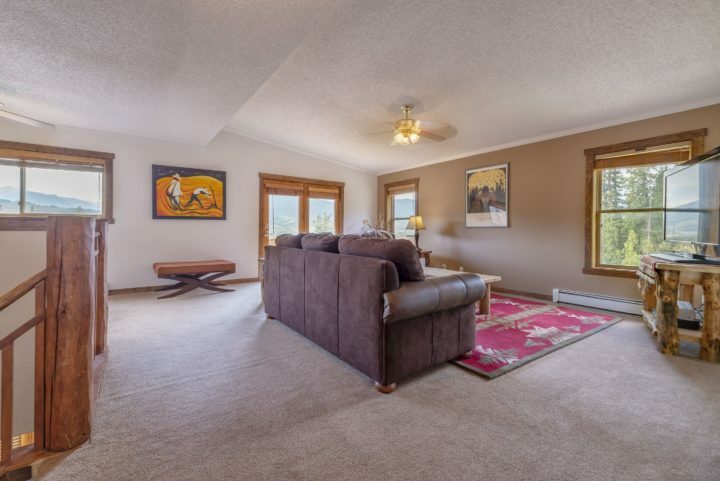 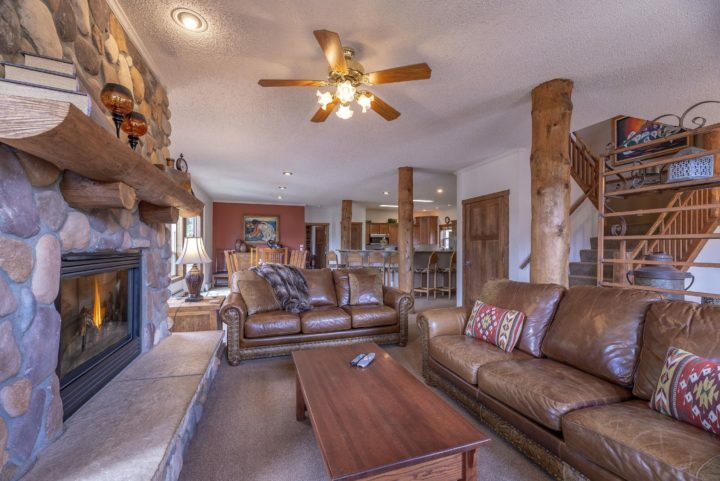 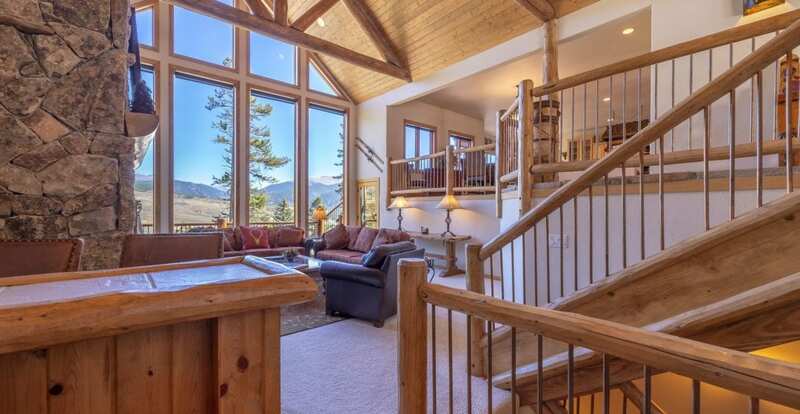 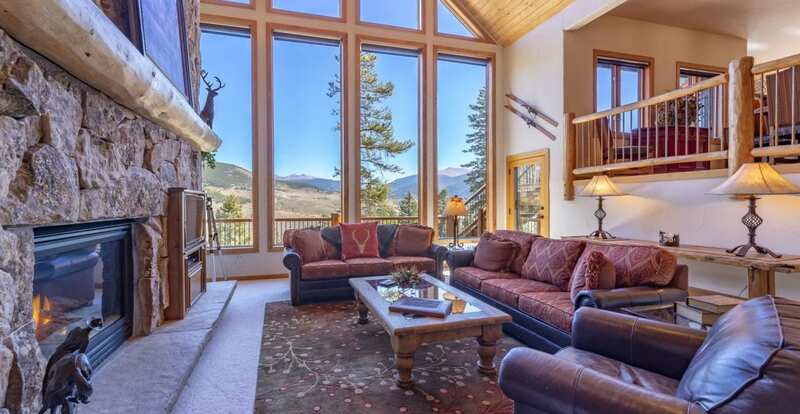 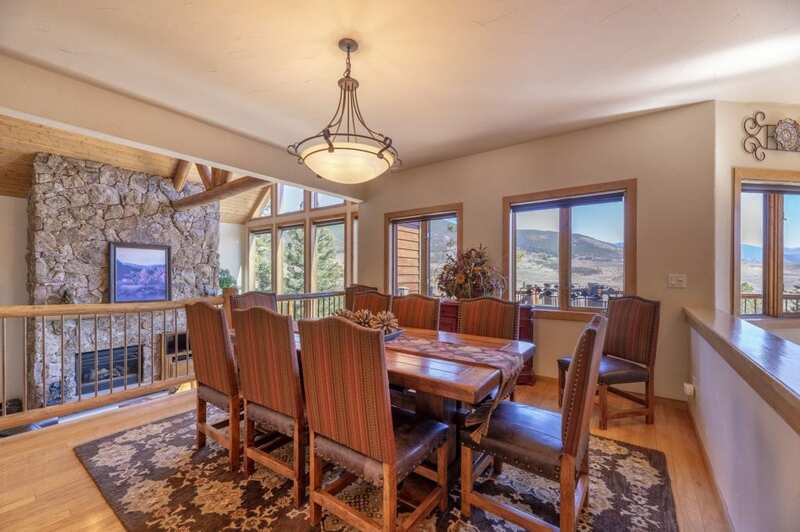 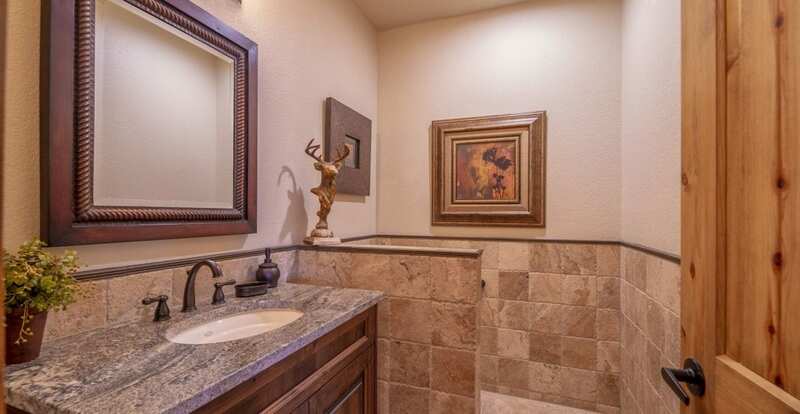 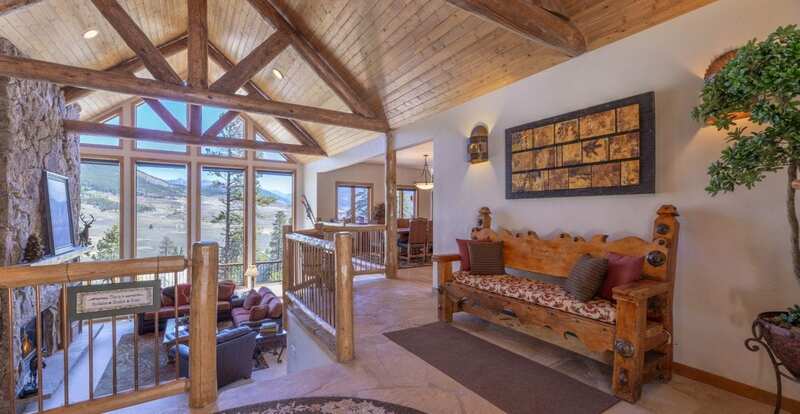 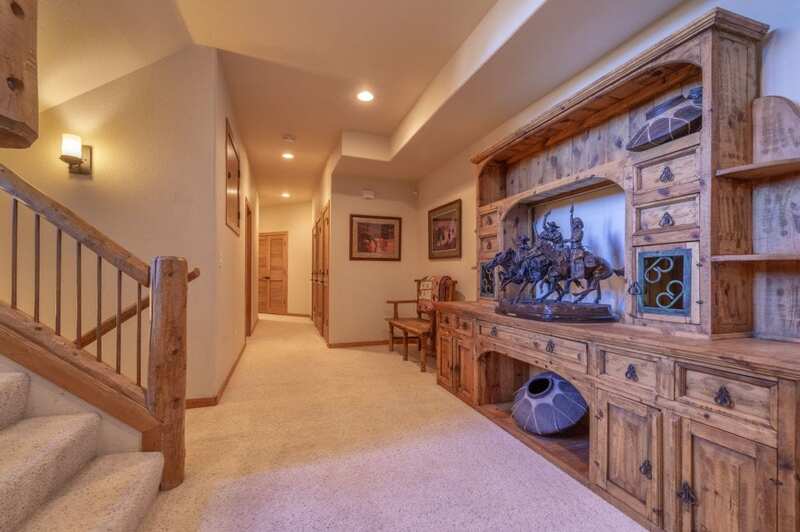 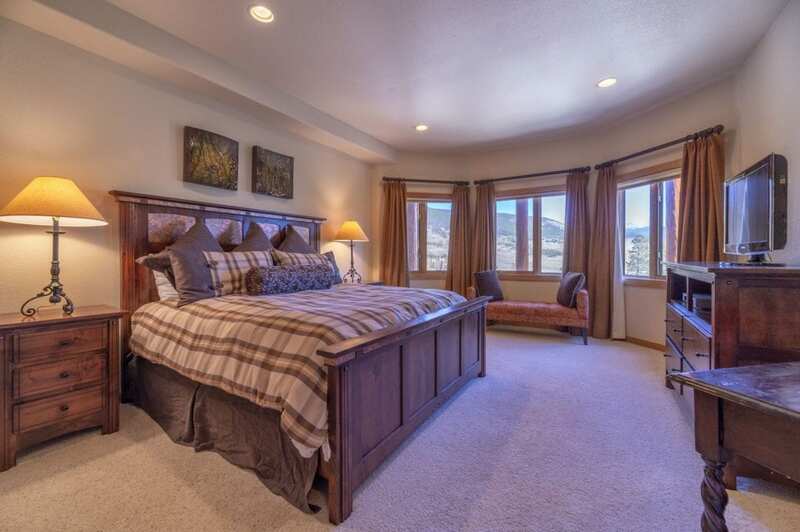 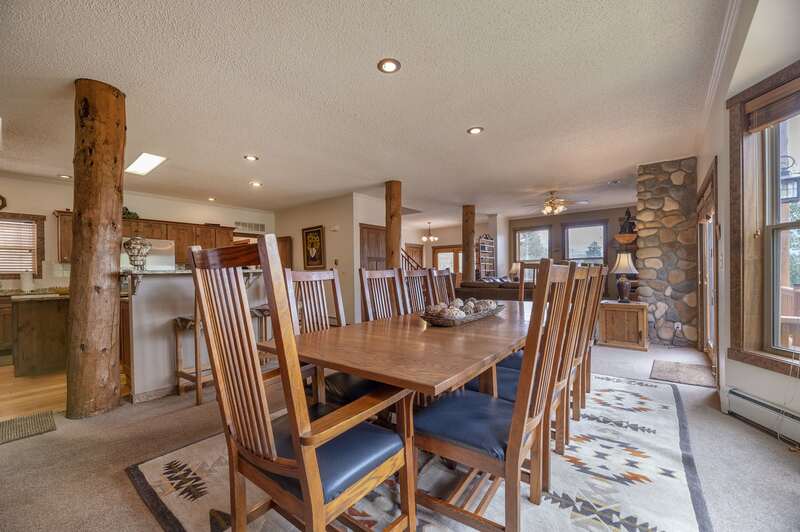 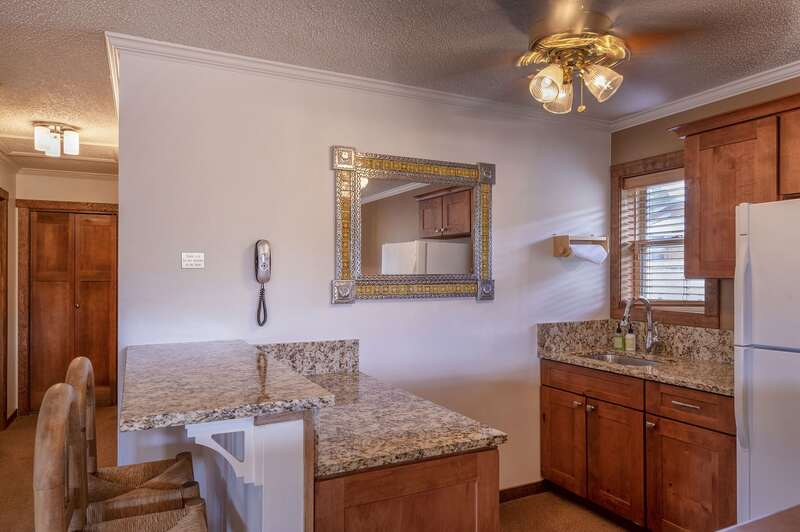 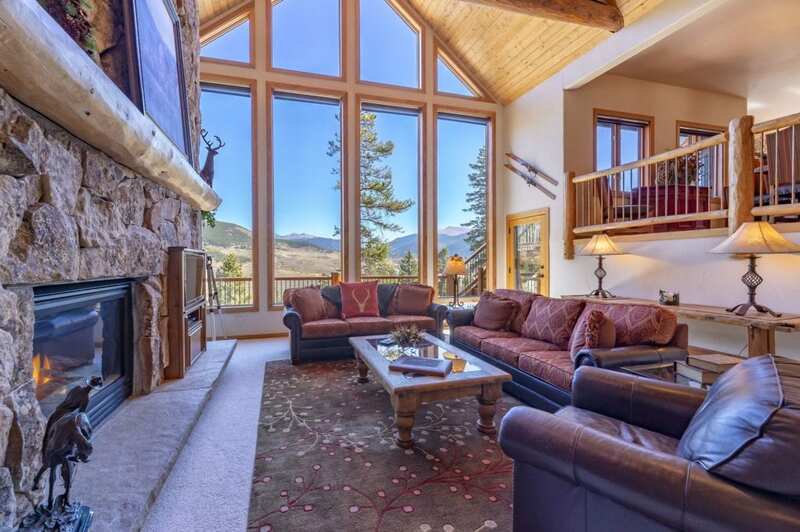 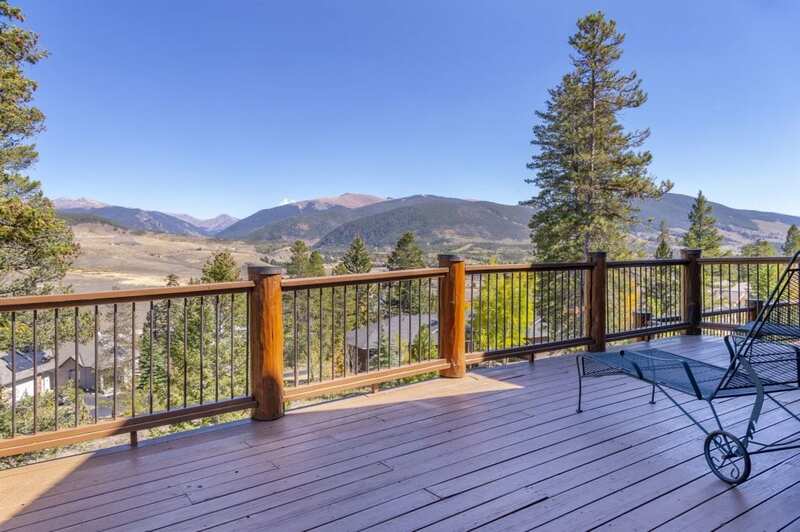 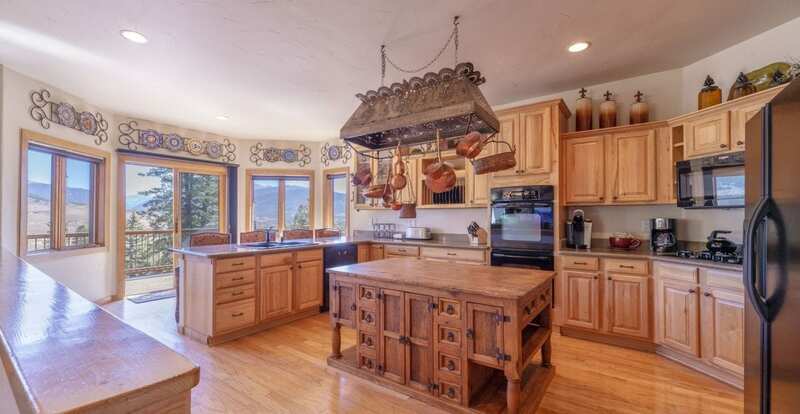 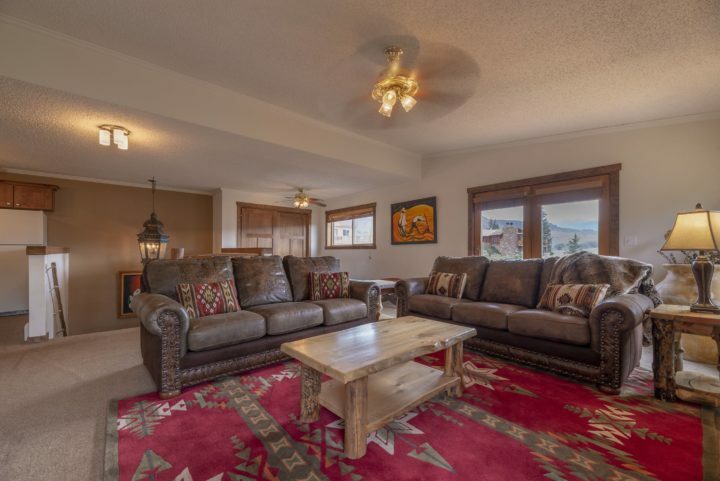 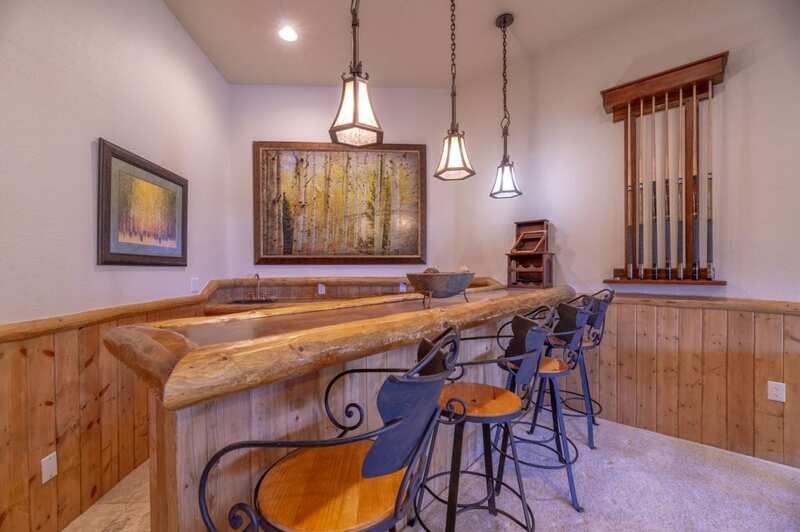 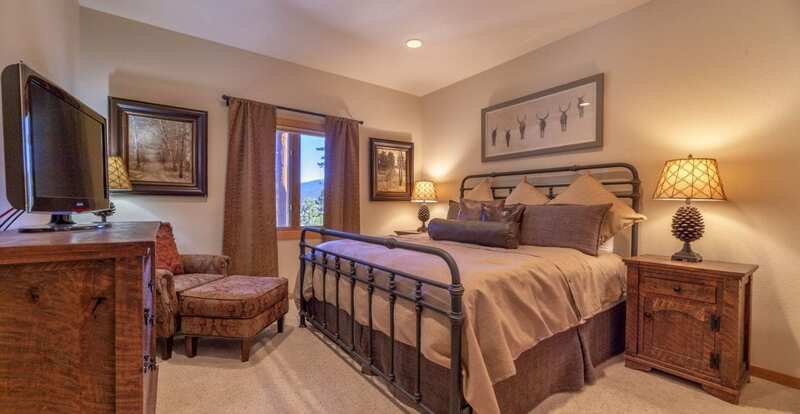 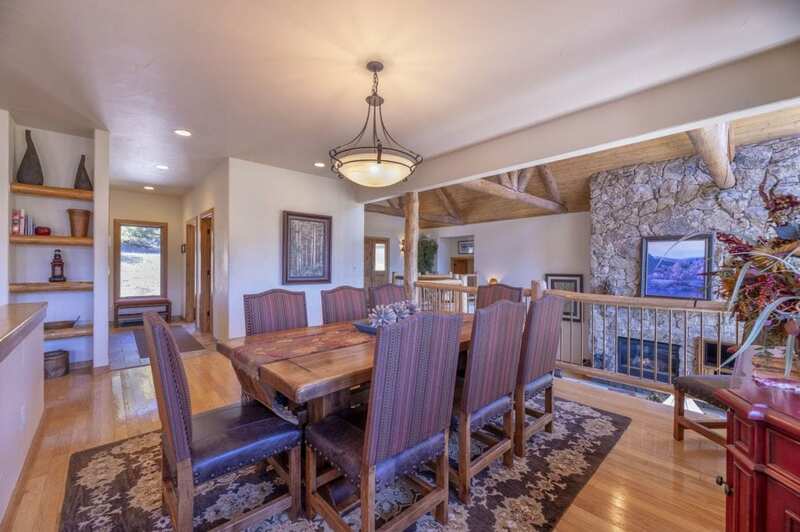 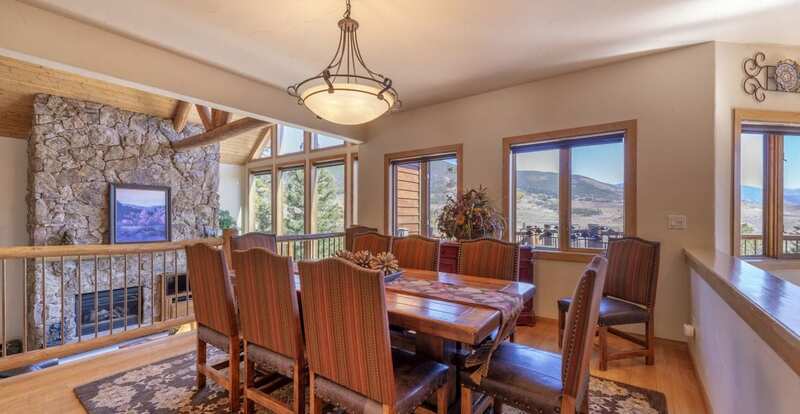 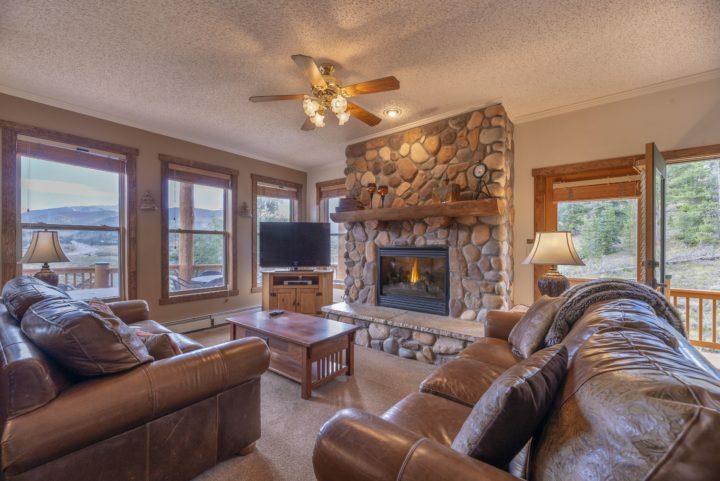 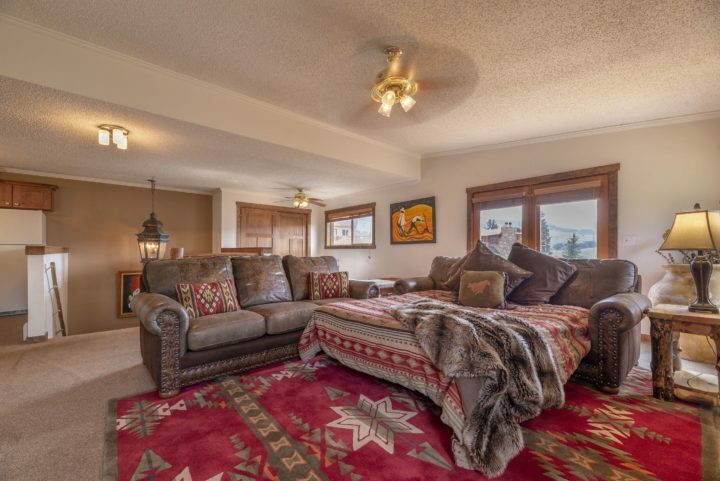 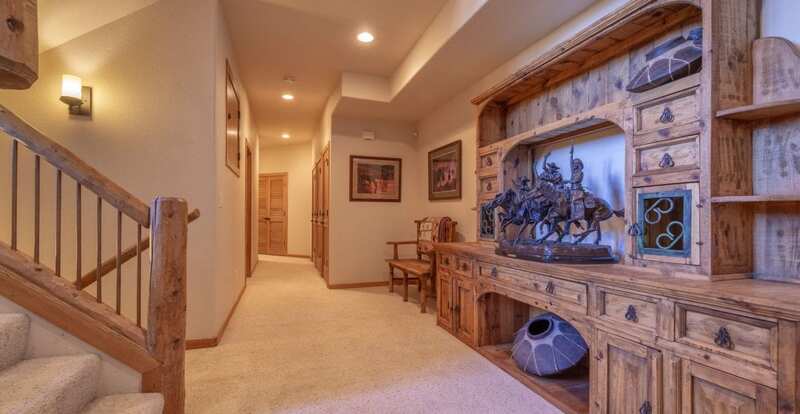 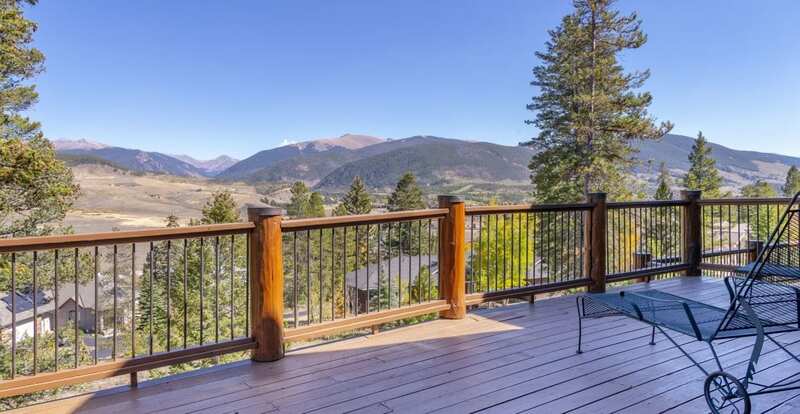 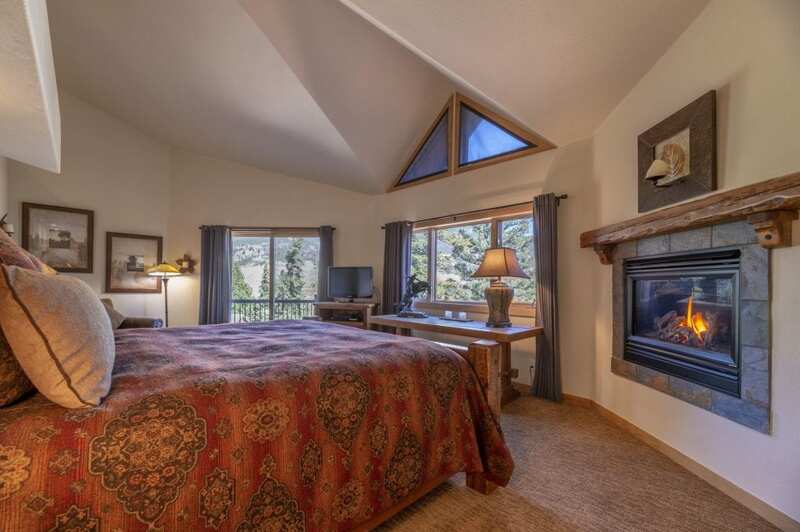 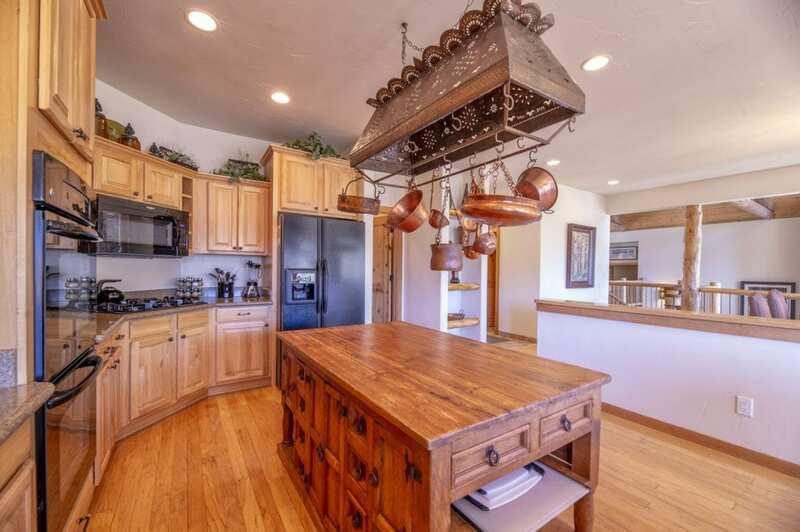 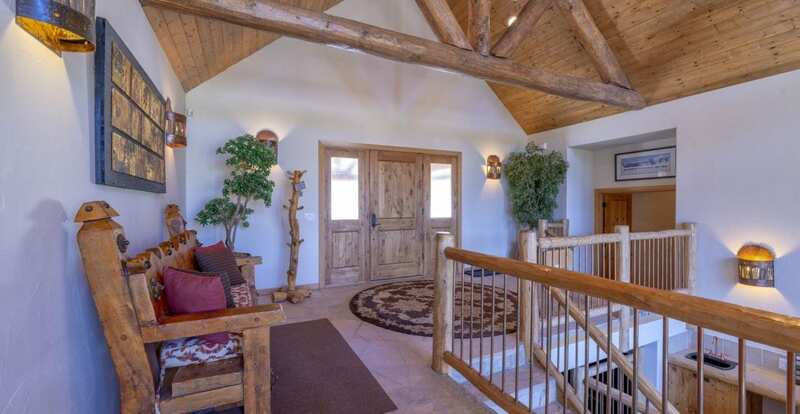 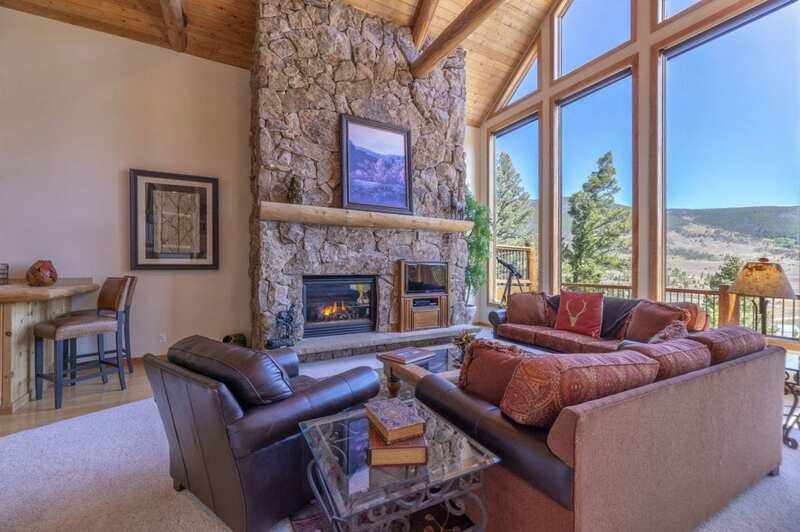 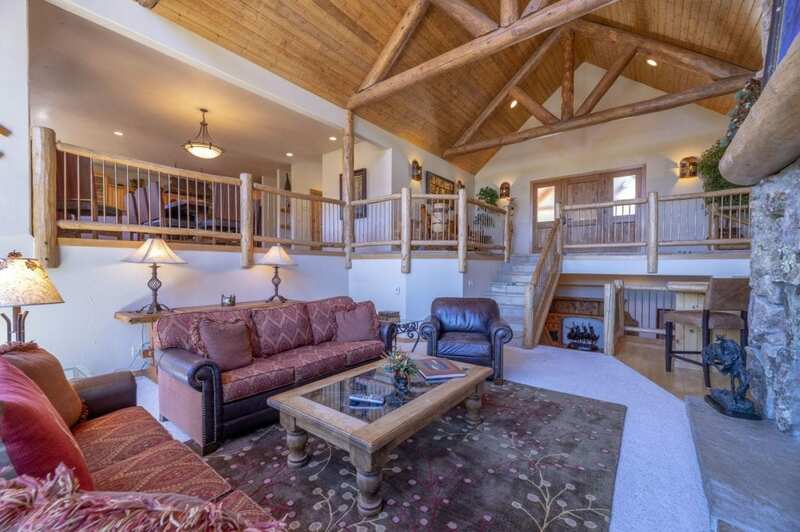 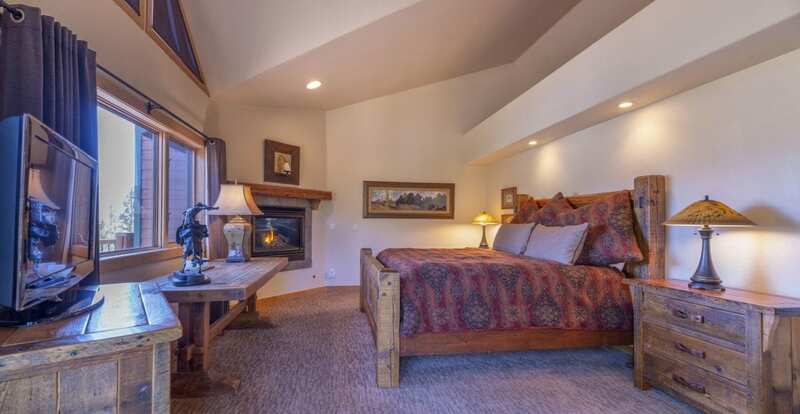 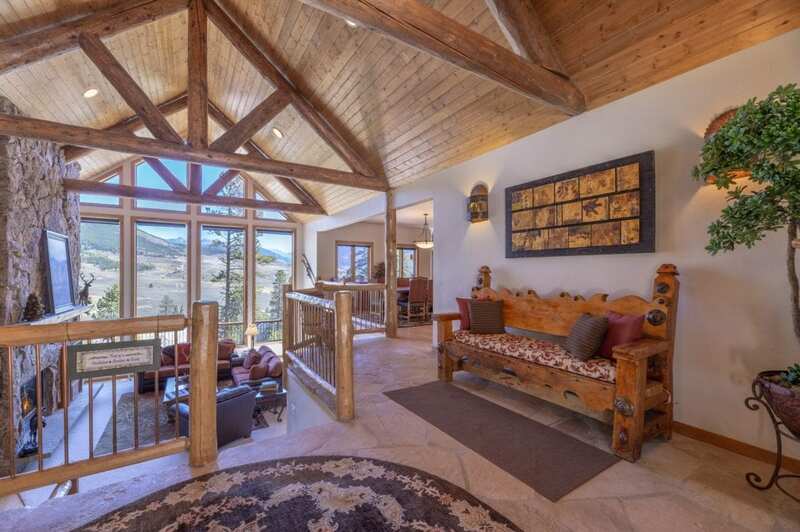 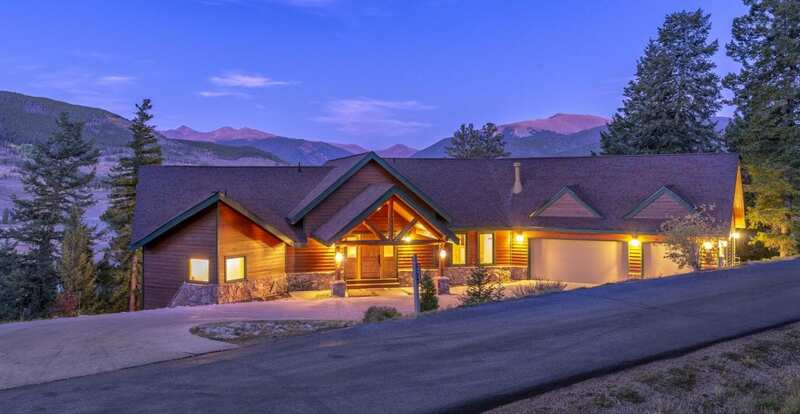 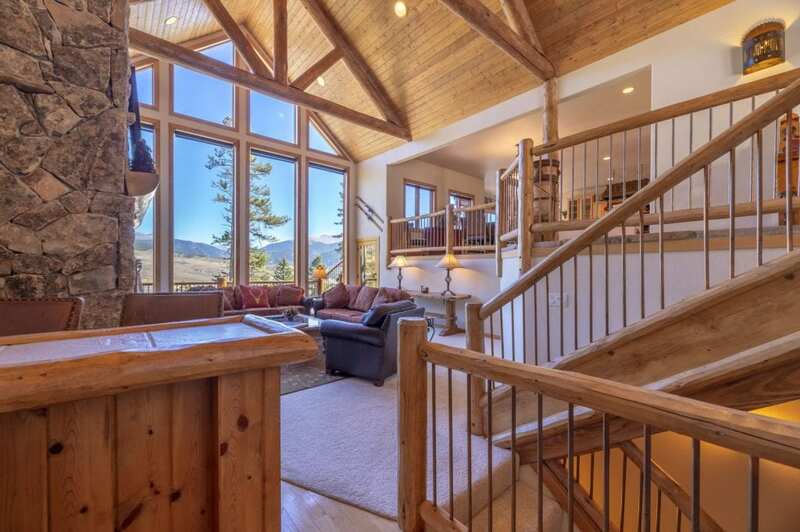 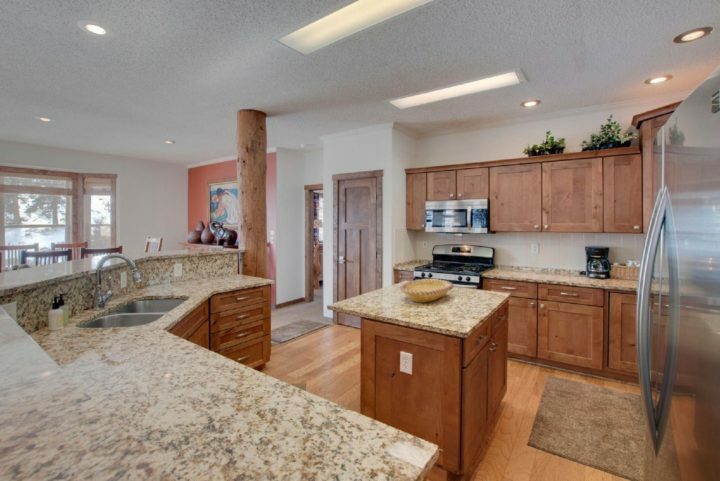 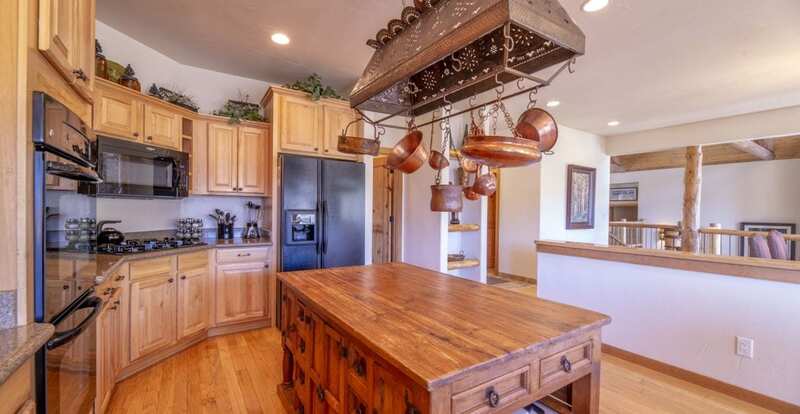 Level 3—No outside access (does have a deck with panoramic view of lake and Continental Divide). 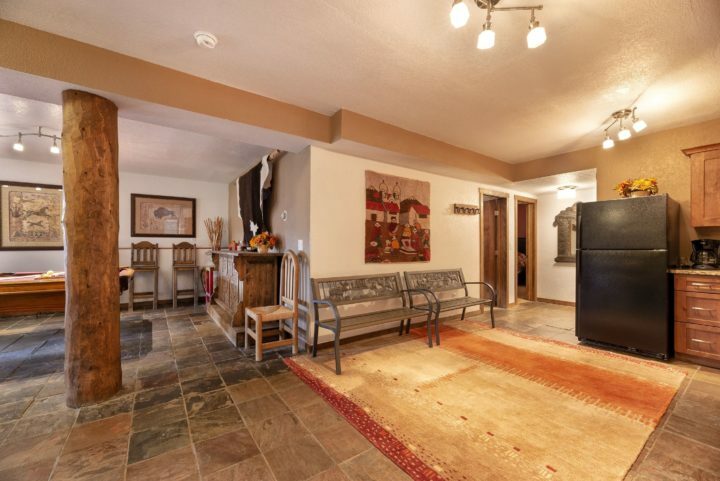 Living Room 3—Queen sleeper sofa; foosball table; 55″ flat screen TV; wet bar area–full-size refrigerator, sink, etc. 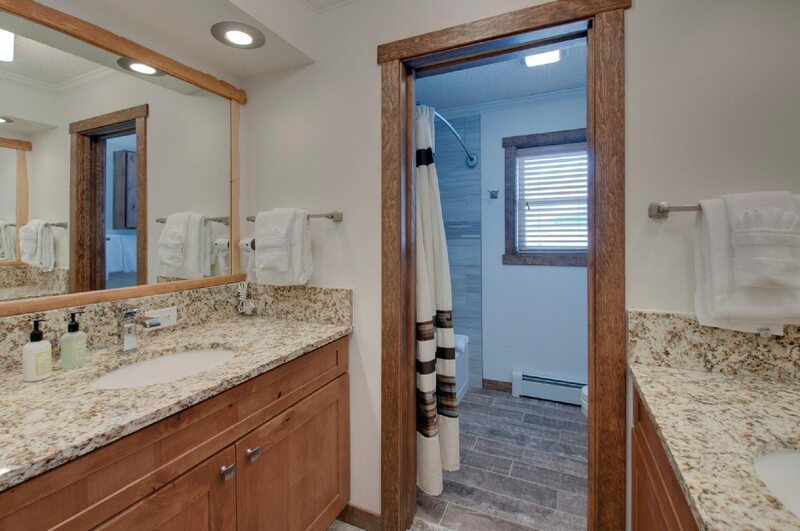 Hall bath for 3rd level (full bath with two vanity areas).